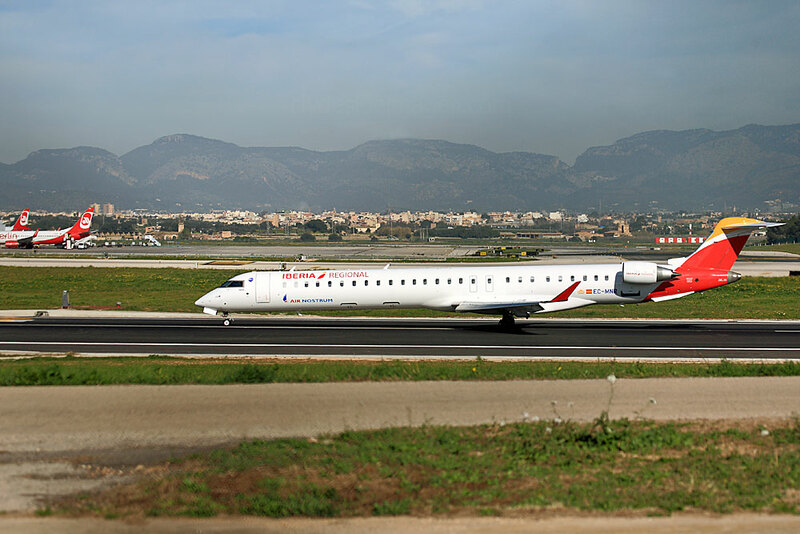 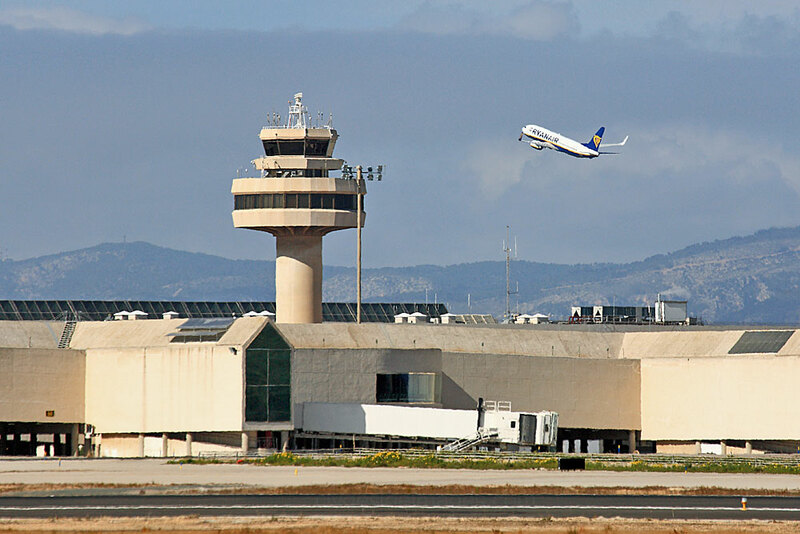 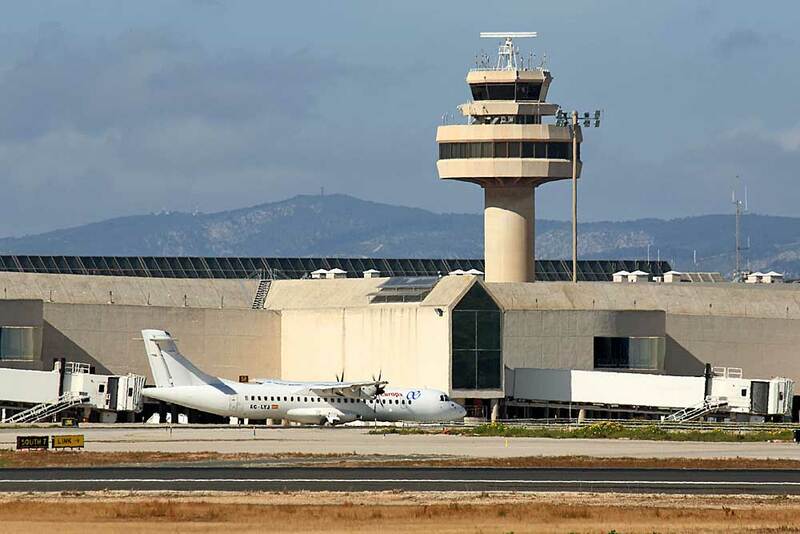 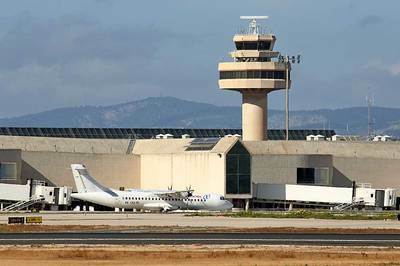 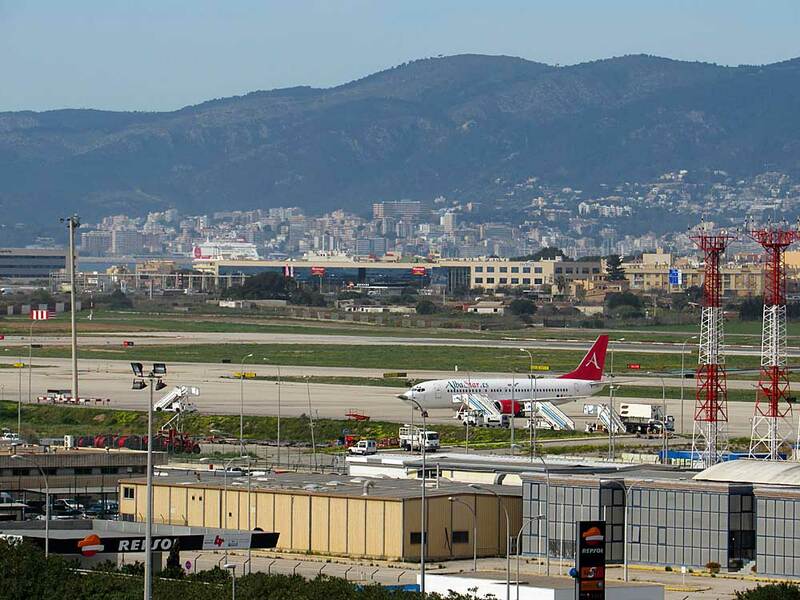 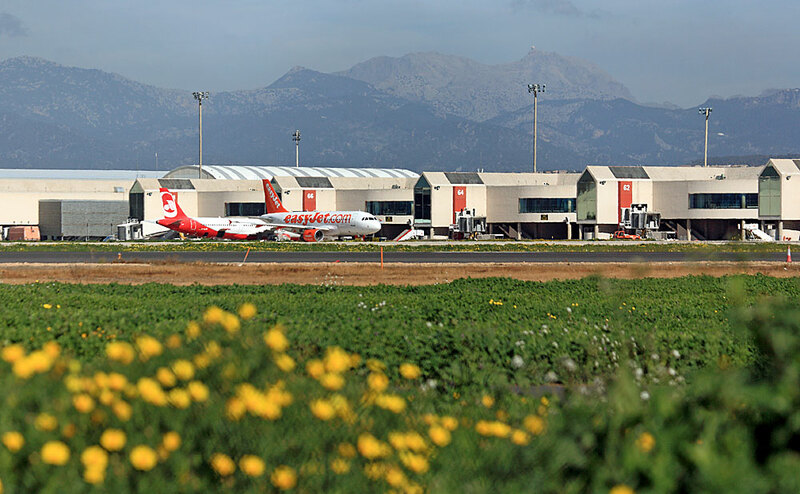 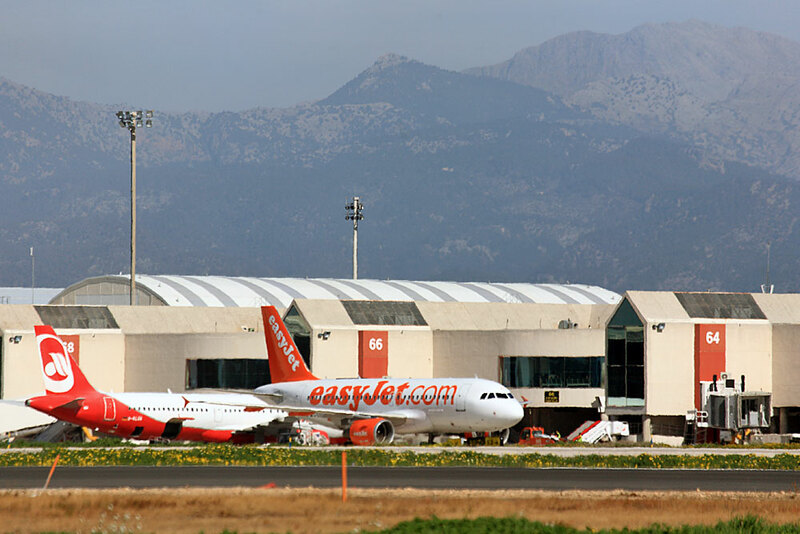 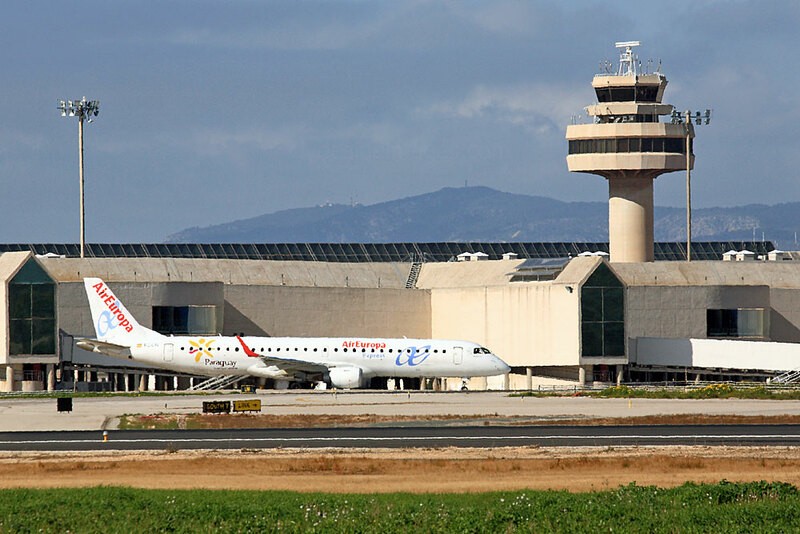 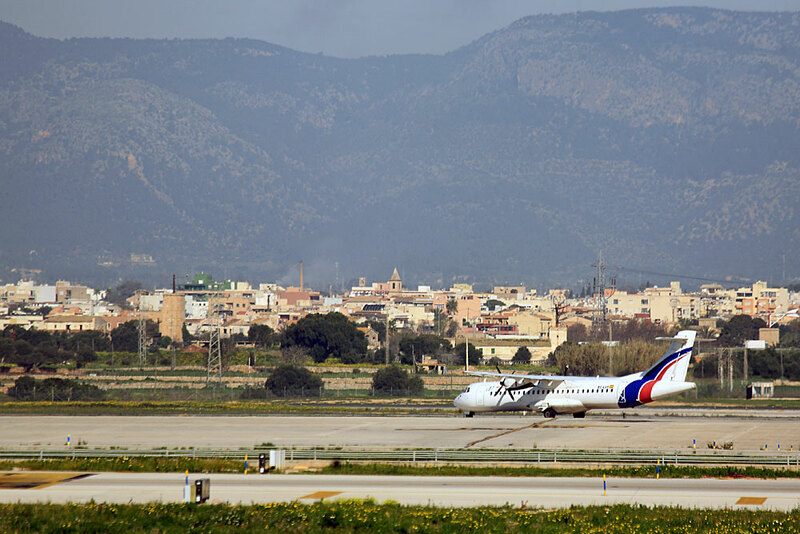 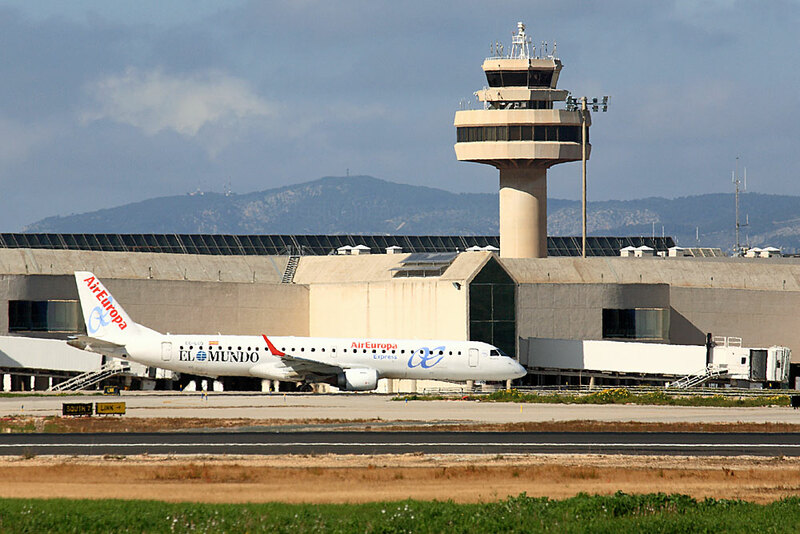 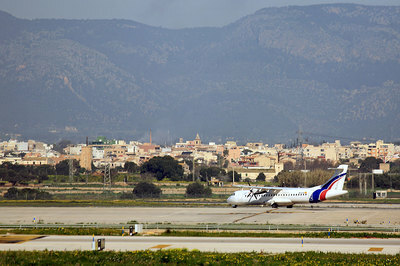 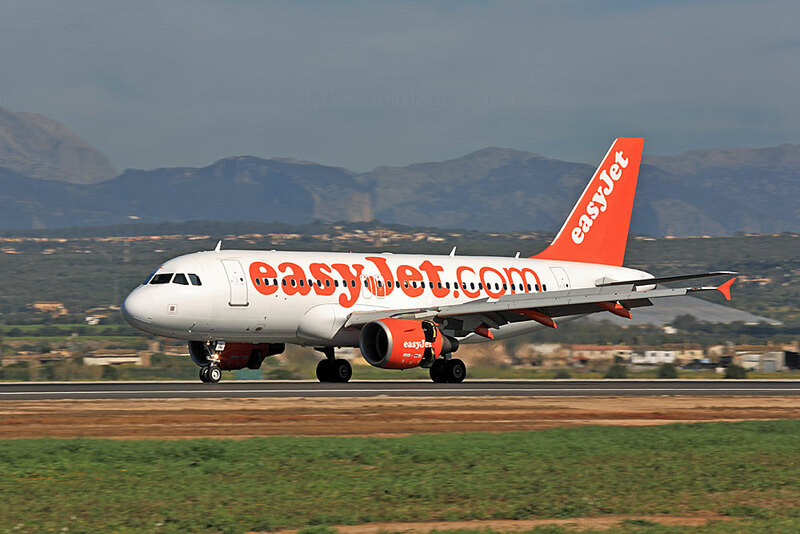 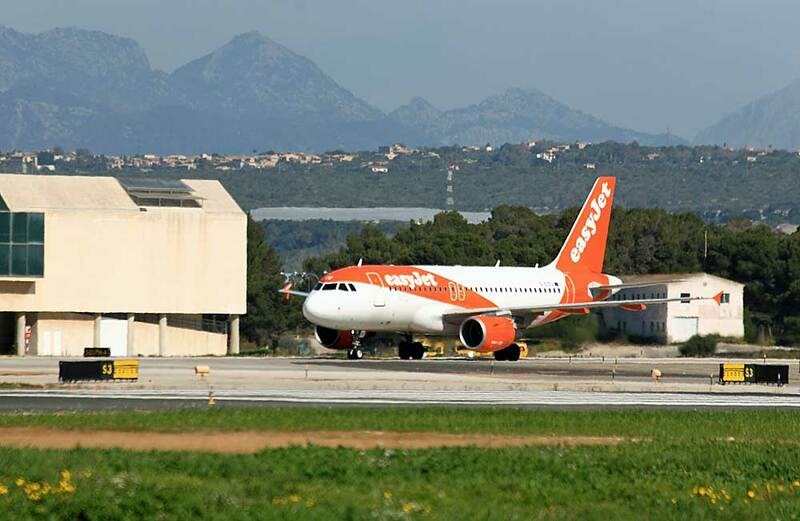 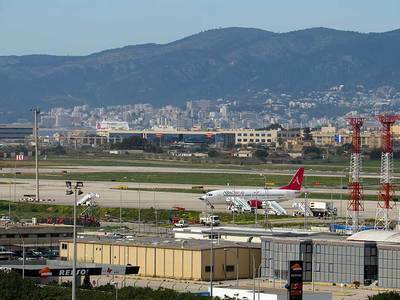 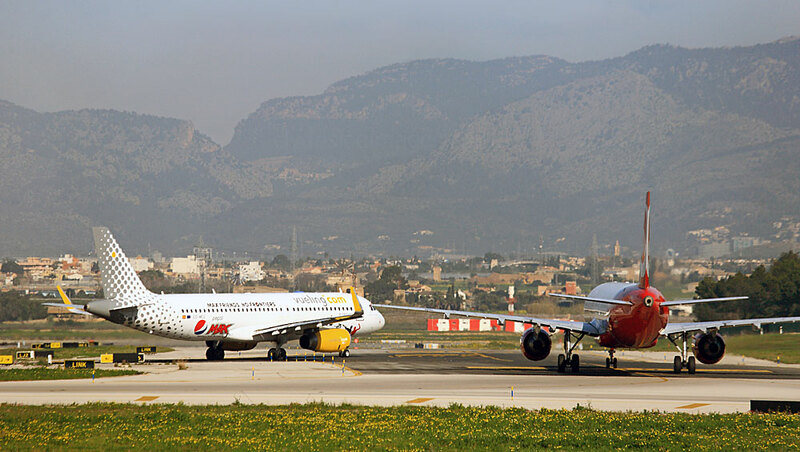 Palma Airport, also known as Palma de Mallorca Son Sant Joan, is located 8km east of Majorca's capital city and is Spain's third-largest airport after Madrid and Barcelona. 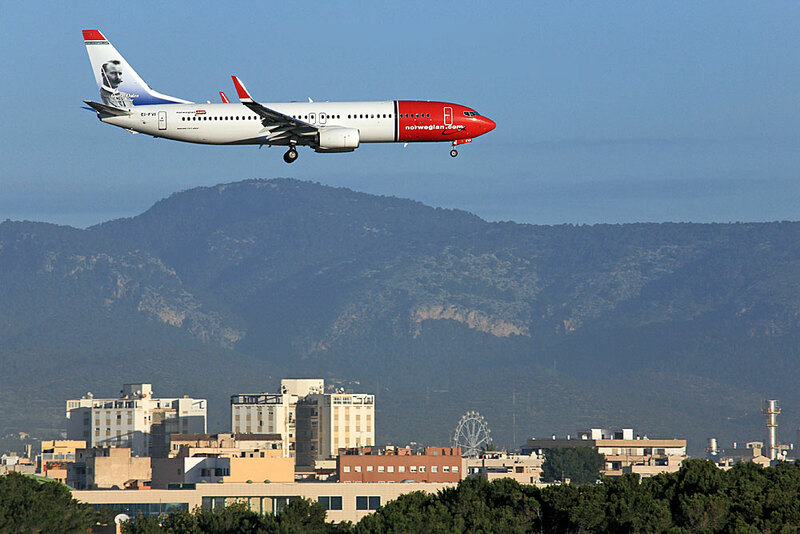 Things can get quite hectic movement-wise during the summer months, especially at weekends, but it's a different story in winter when the numbers and variety of visiting aircraft drop significantly, to around 10% of peak levels. 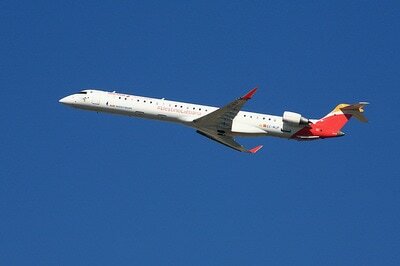 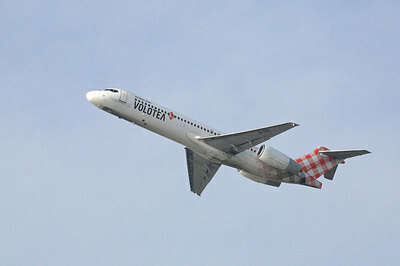 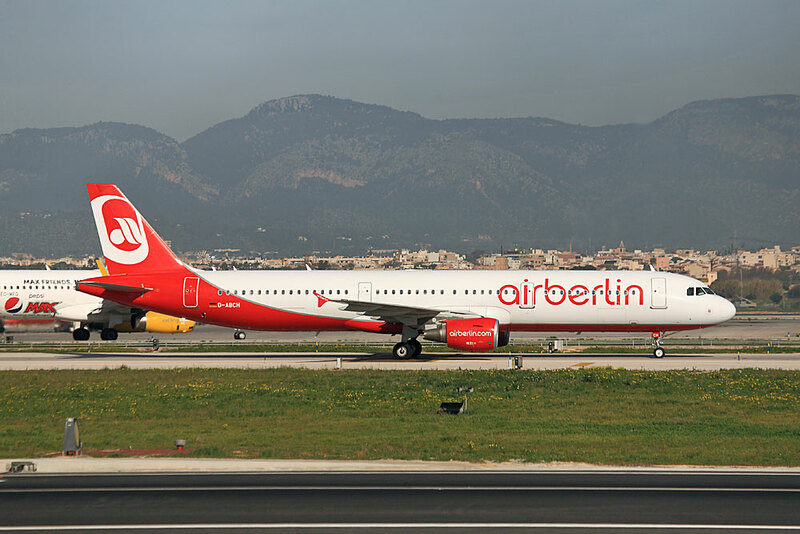 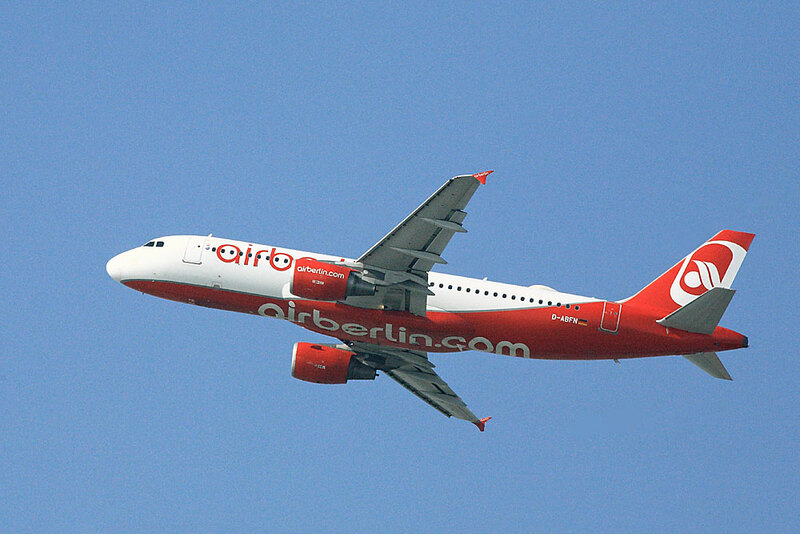 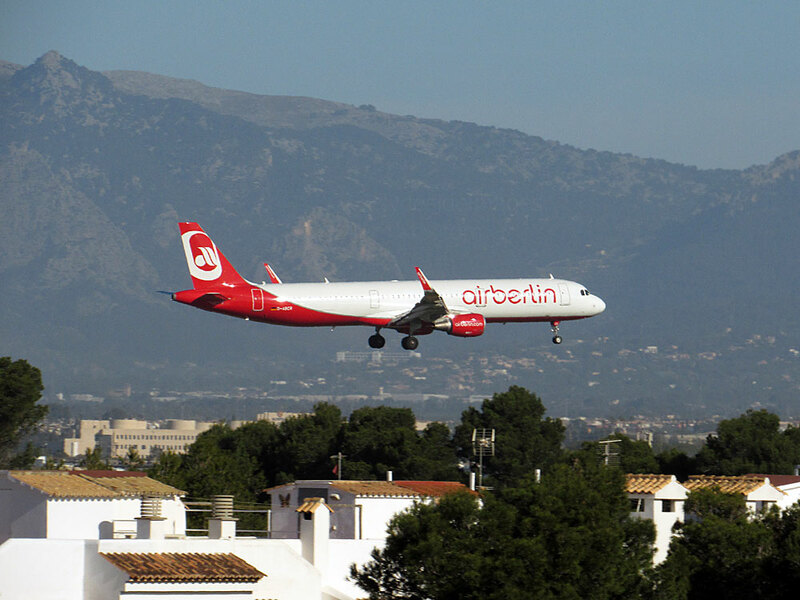 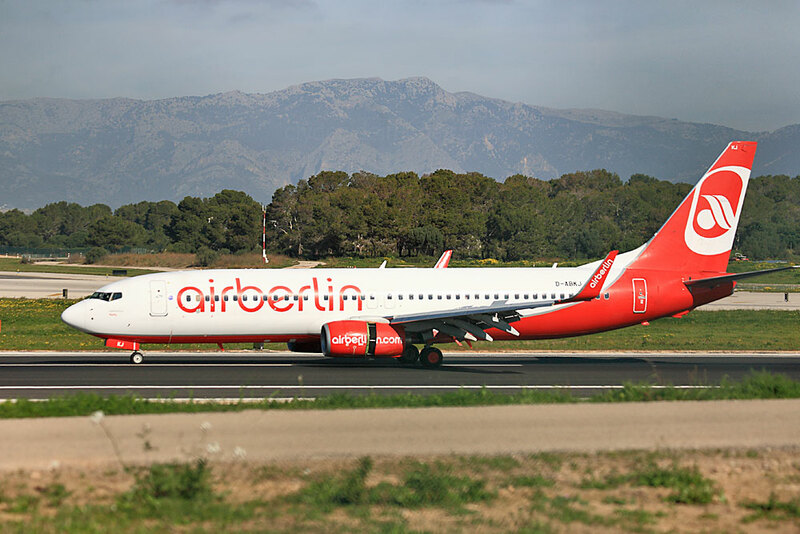 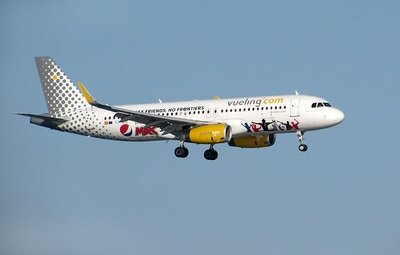 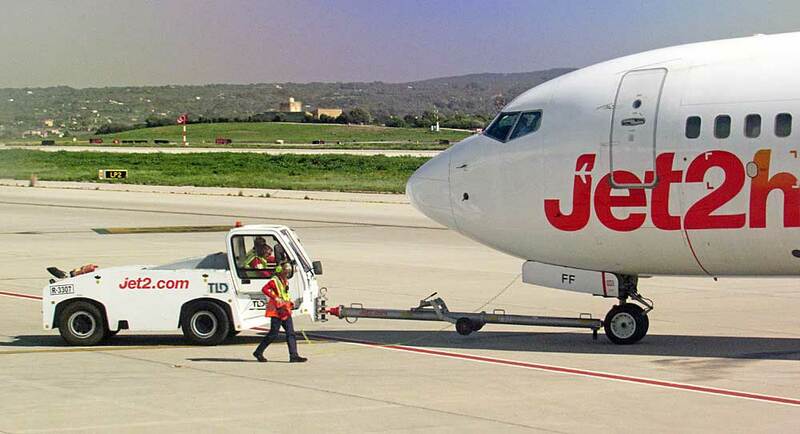 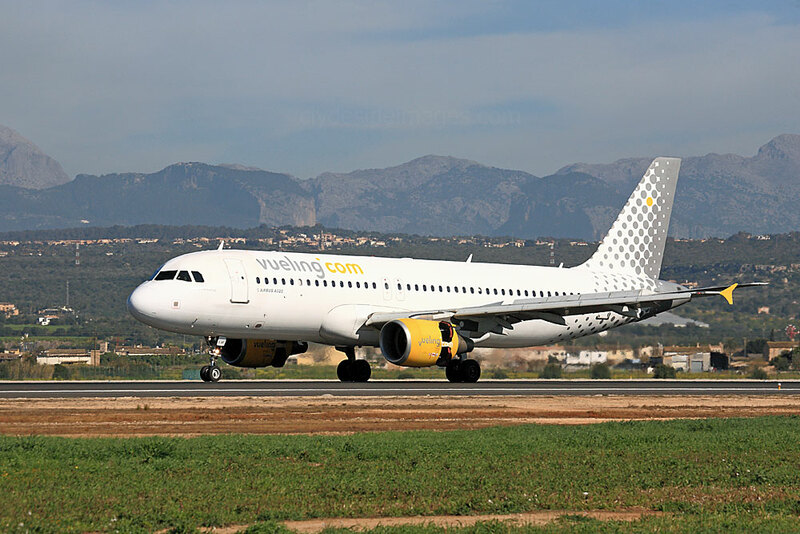 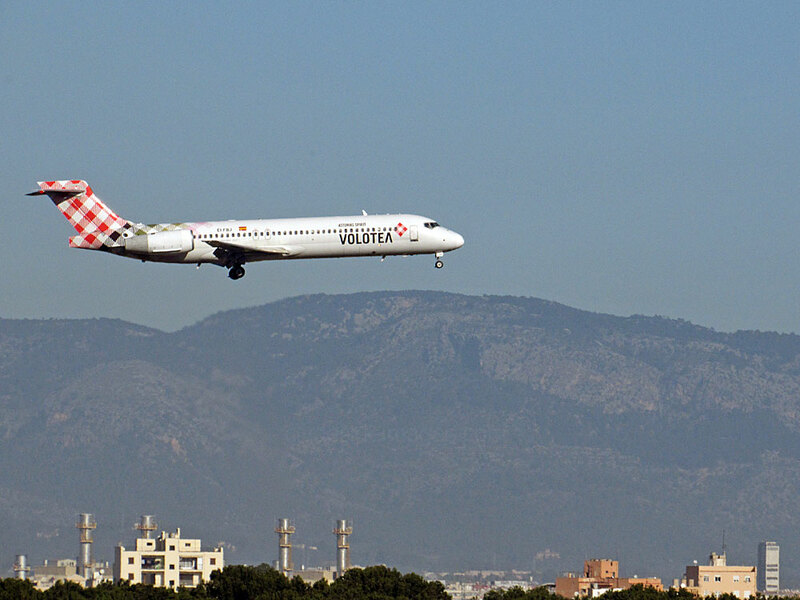 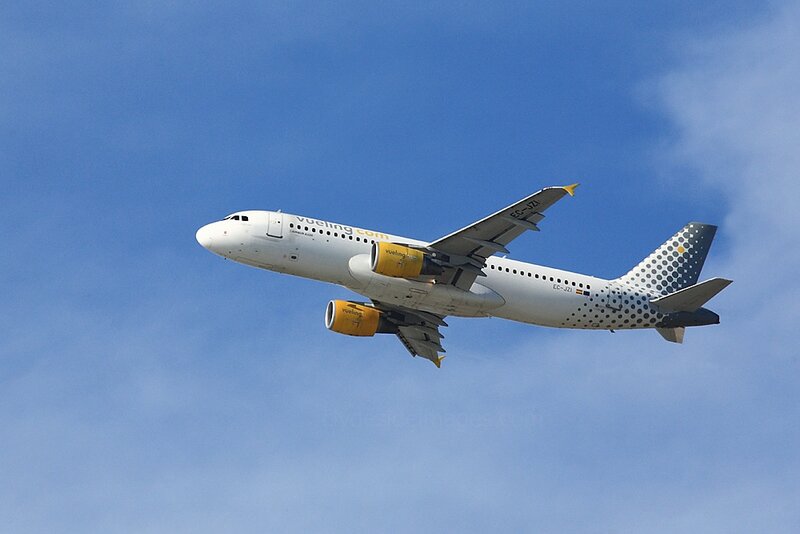 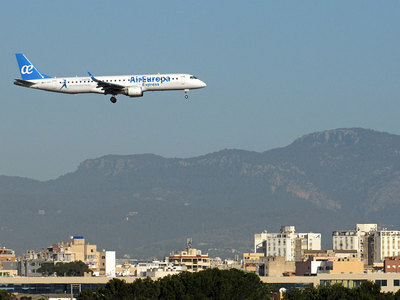 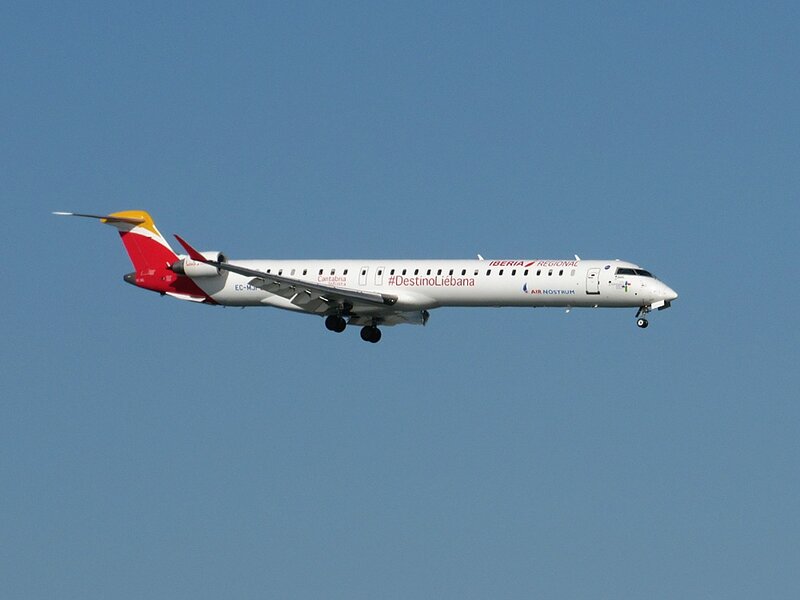 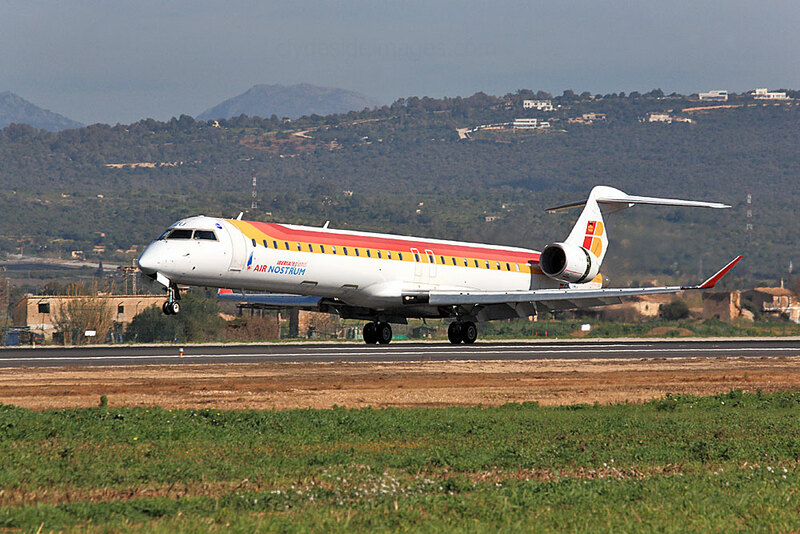 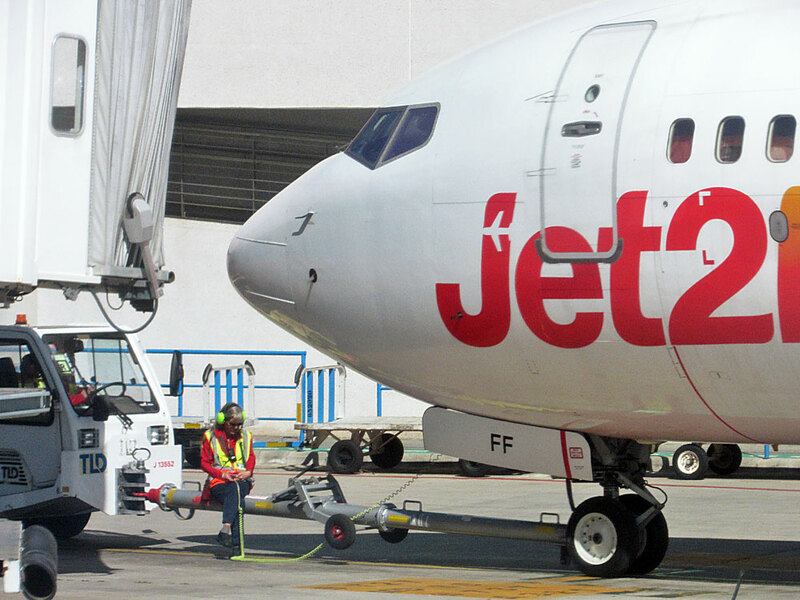 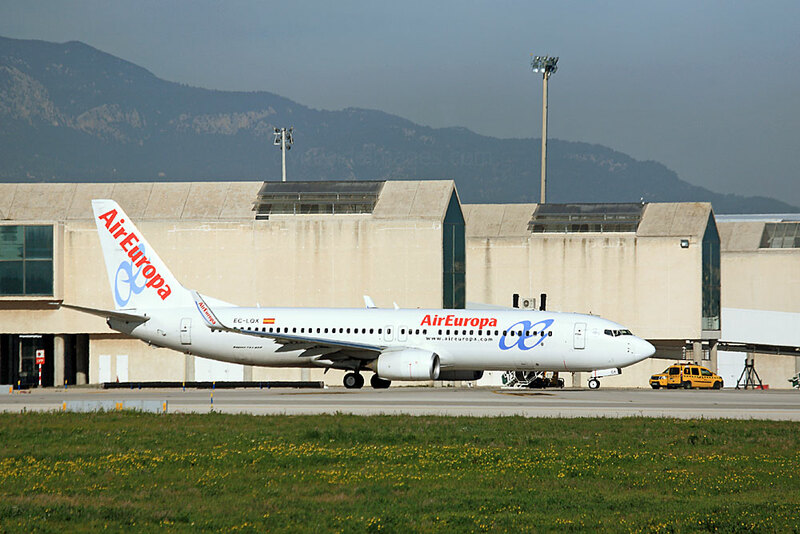 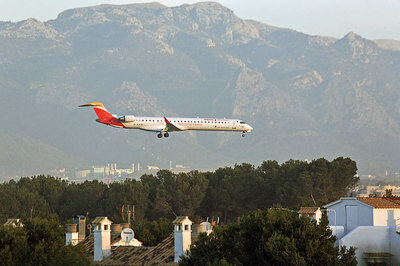 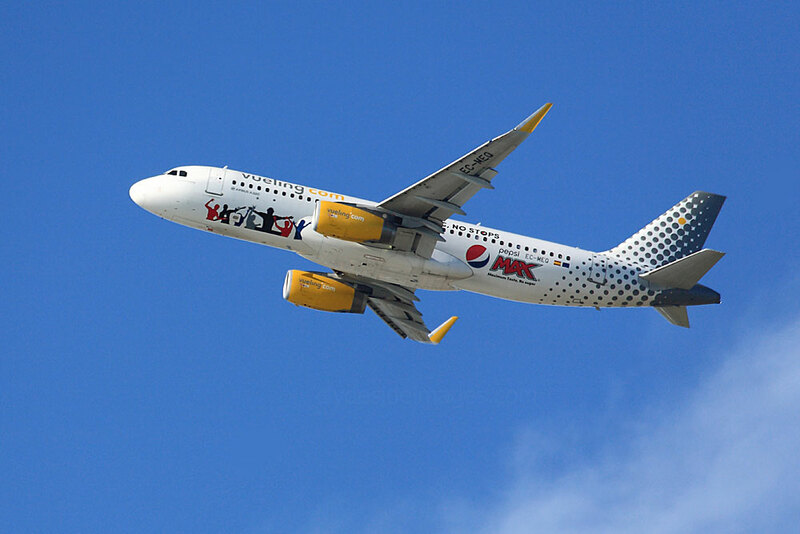 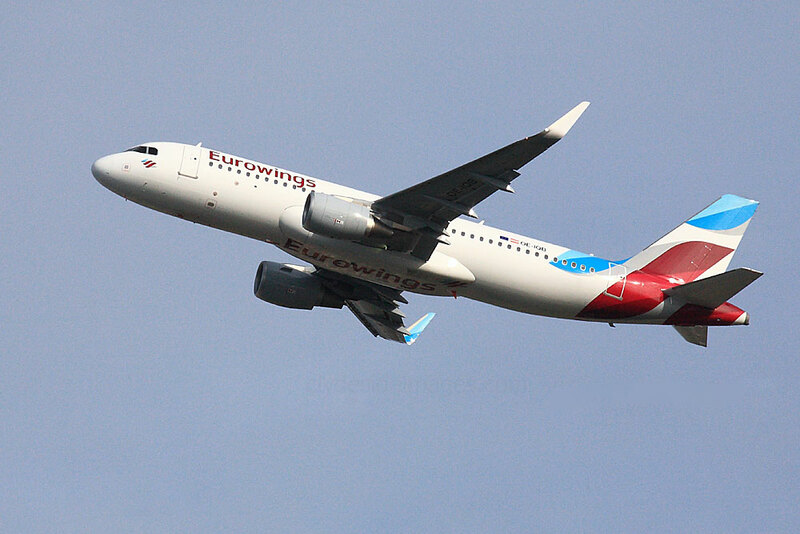 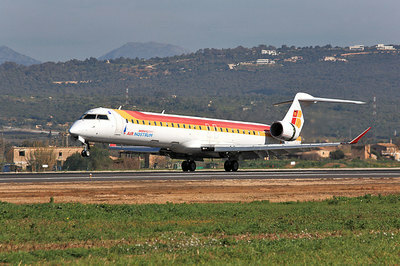 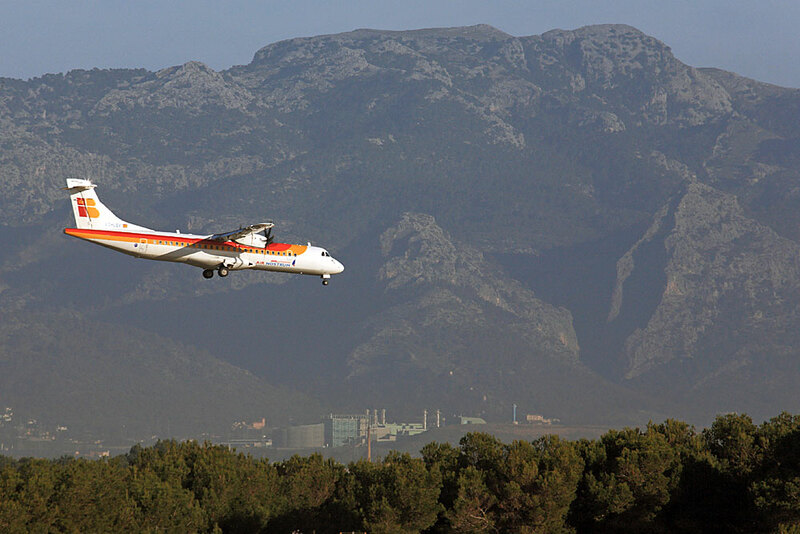 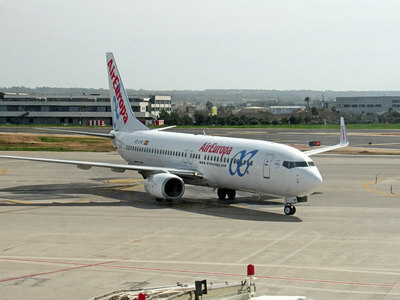 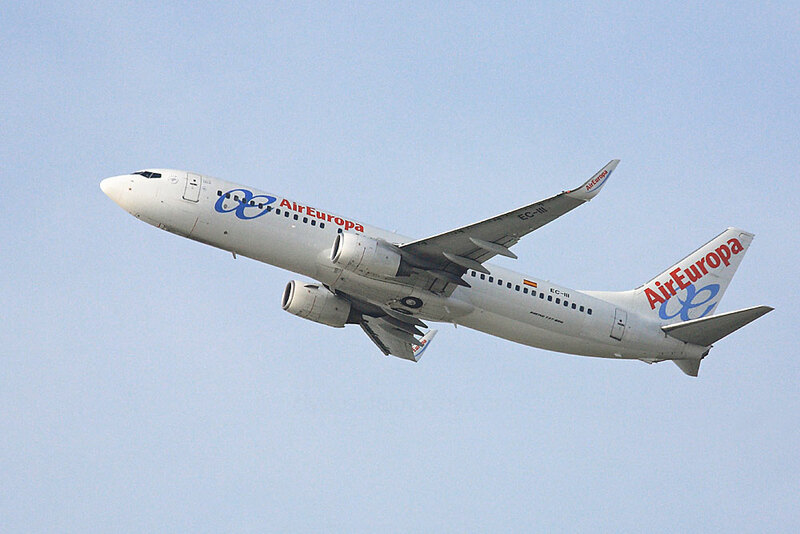 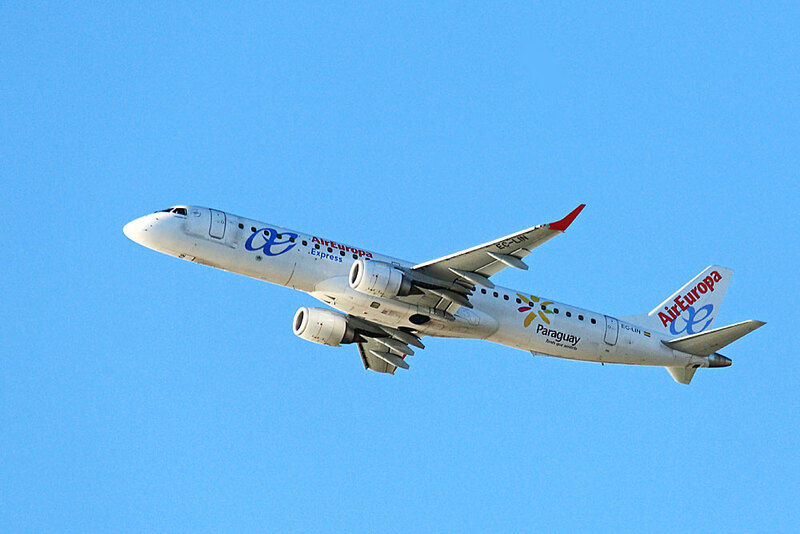 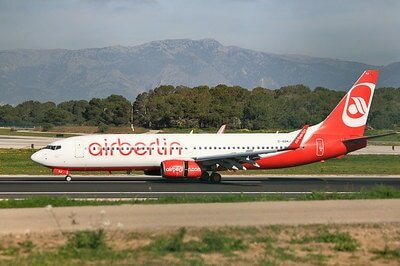 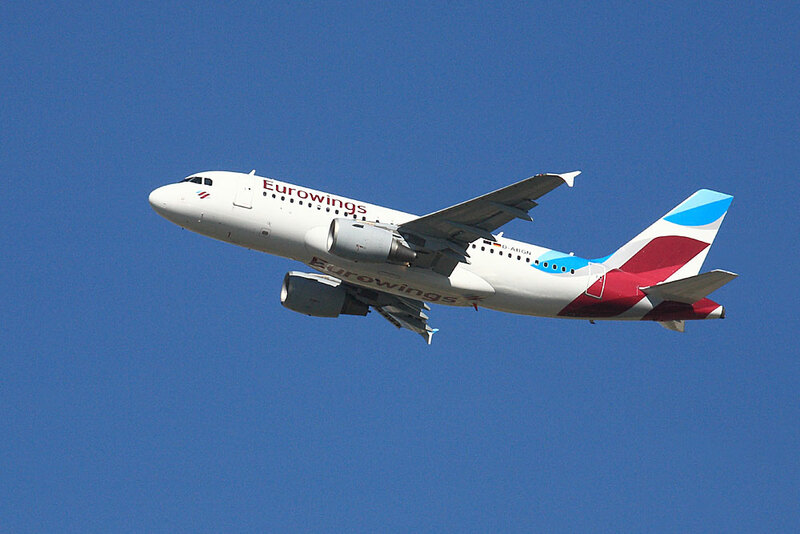 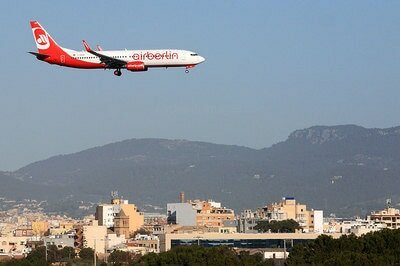 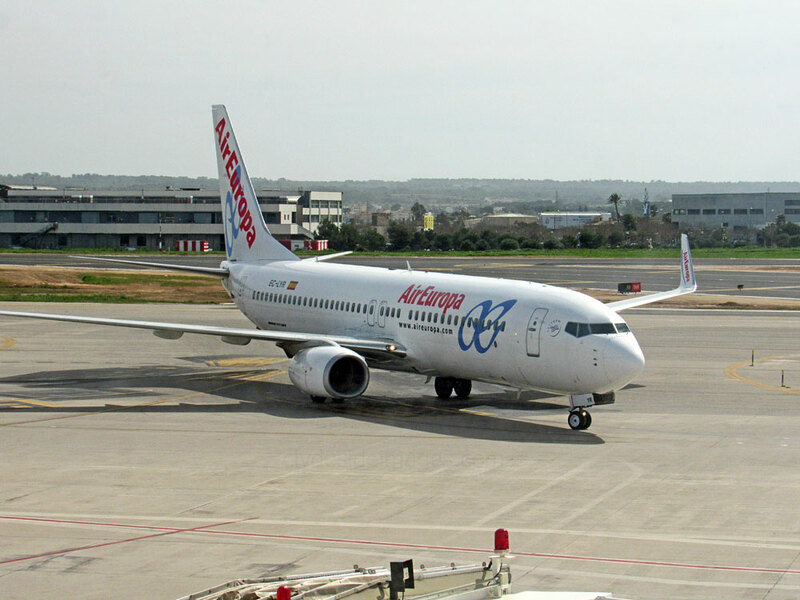 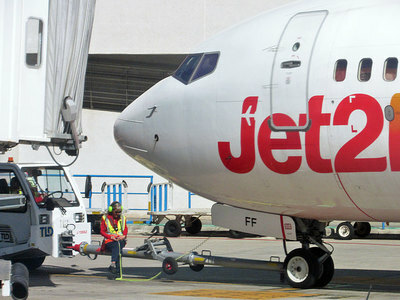 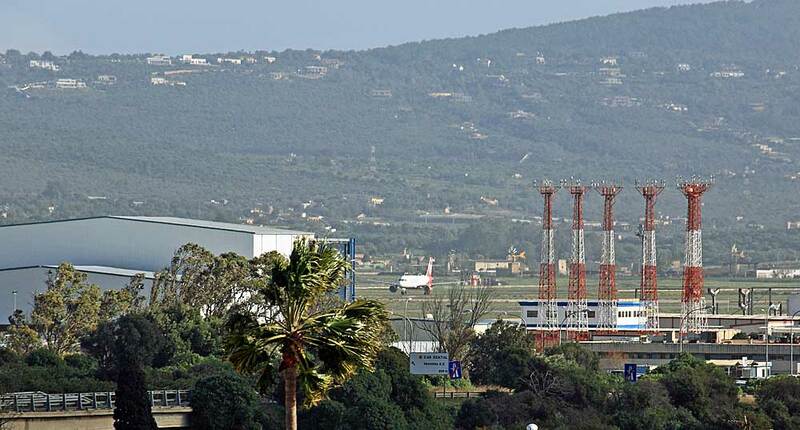 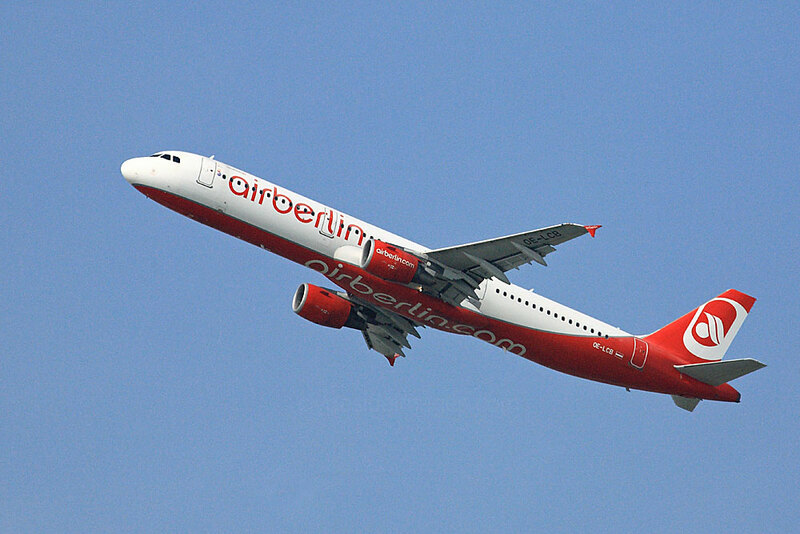 Much of the airliner traffic is from the Spanish carriers Iberia, Vueling and Air Europa and German carrier Air Berlin which uses Palma Airport as a hub. 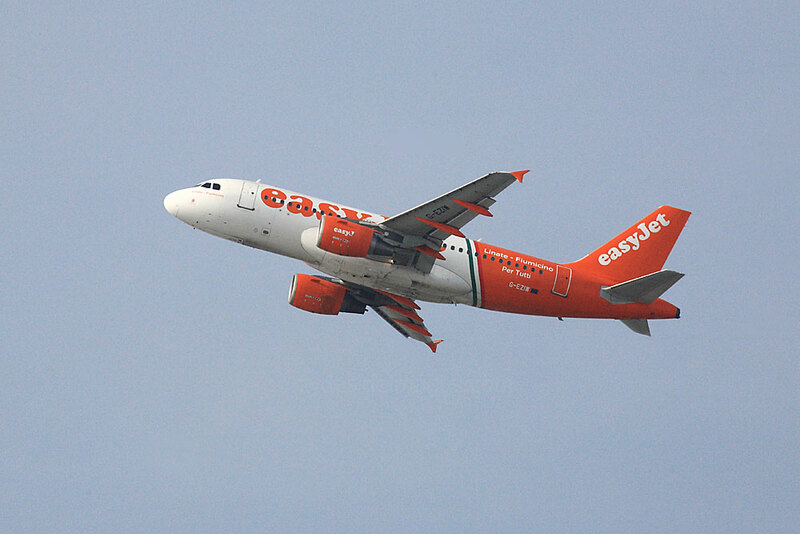 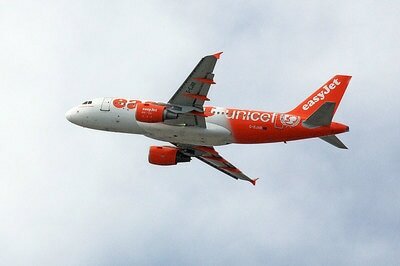 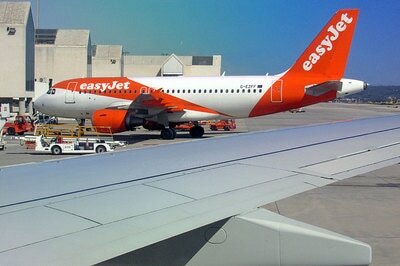 Ryanair and easyJet planes are also common. 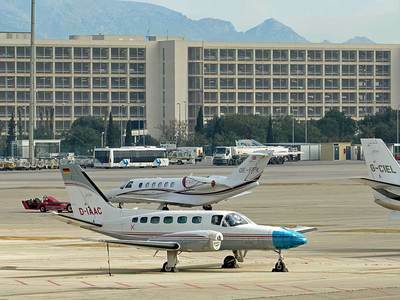 Even so, irrespective of the time of year, there's always the chance of an interesting biz-jet, general aviation or military visitor putting in an appearance. 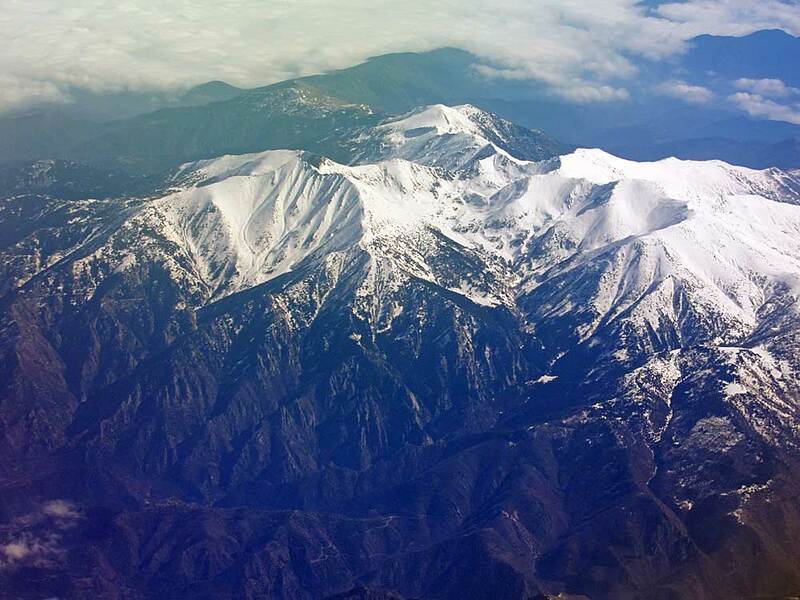 ​Our Jet2 Holiday flight from Glasgow in late February 2017 for a week-long stay took 2 hrs 45 minutes and, although a blanket of cloud obscured the landscape for much of the journey, there were spectacular views of the snow-capped Pyrenees and Andorra from the windows on the opposite side of the plane which I could only glimpse from my seat. A few planes came quite close to ours during the flight including a British Airways airliner which sped past several thousand feet below, and what I presume was a Spanish military jet rocketing skywards trailing a thick plume of dark smoke 'airshow style'. 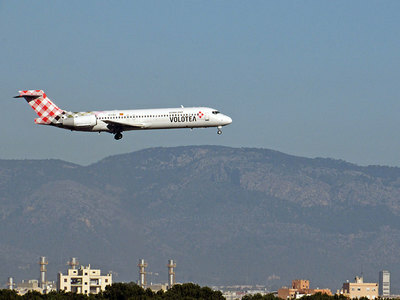 Majorca was cloudy on arrival with only moderate visibility due to a haze and our approach was overland rather than coming in from the sea. 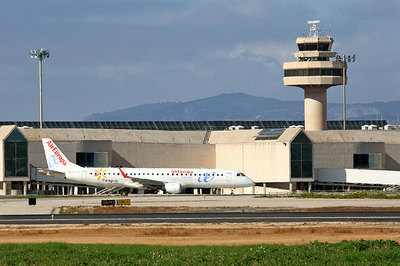 The terminal area was very quiet with only a handful of airliners on stand and a few smaller planes on the biz-jet ramp. 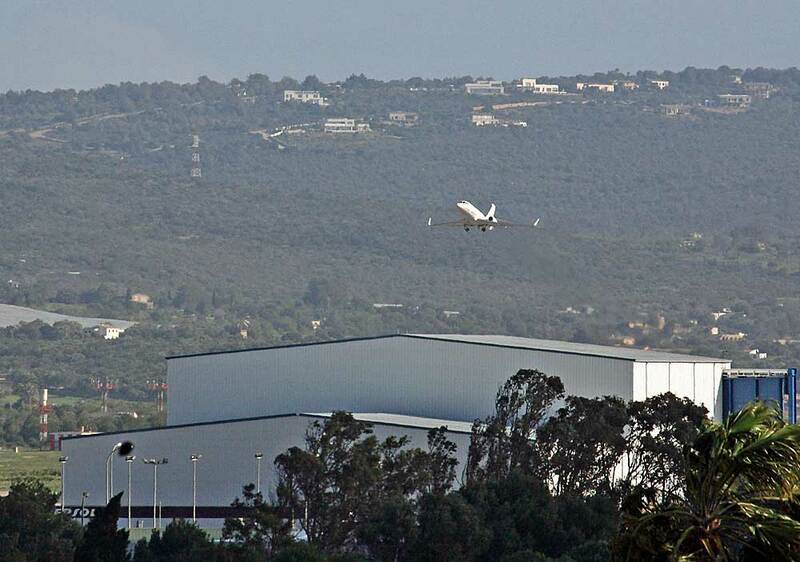 The shot below was taken from the multi-storey car park which also looks onto the biz jet ramp. 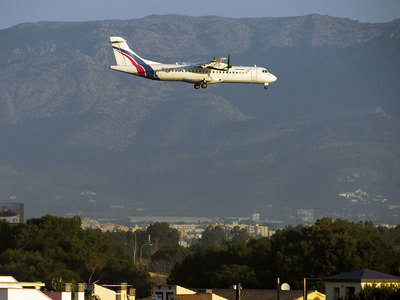 ​A 10-minute transfer by taxi saw us at the Hotel Marina Luz in Ca'n Pastilla where I was pleased to discover that staff had responded to my email request for a high room overlooking the bay (and the normal approach for Runway 06L), allocating Room 420. 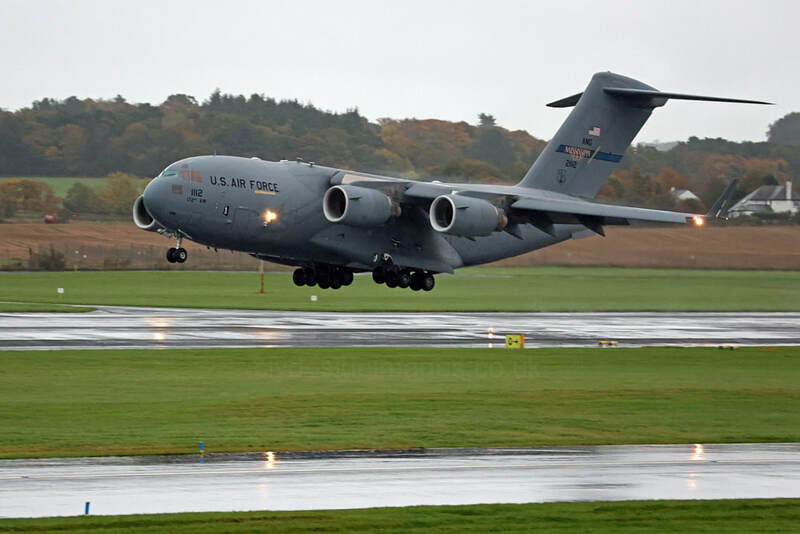 A 400mm lens or above is adequate to capture the action from here, whether the planes are on short finals for 06L or taking-off to the south. 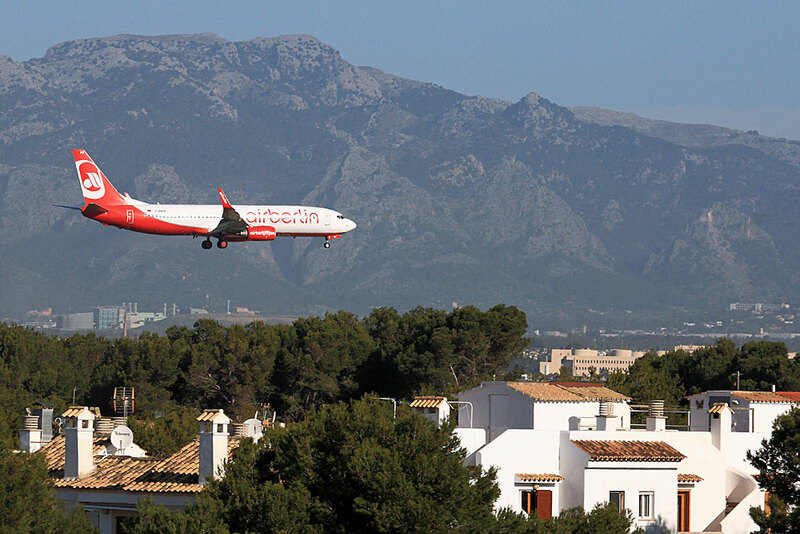 Balconies on the fifth floor of the hotel would be even better as part of the actual airport would be visible and aircraft lifting off from Runway 24R could be snapped against a mountain backdrop rather than 'sky only' a few moments later. 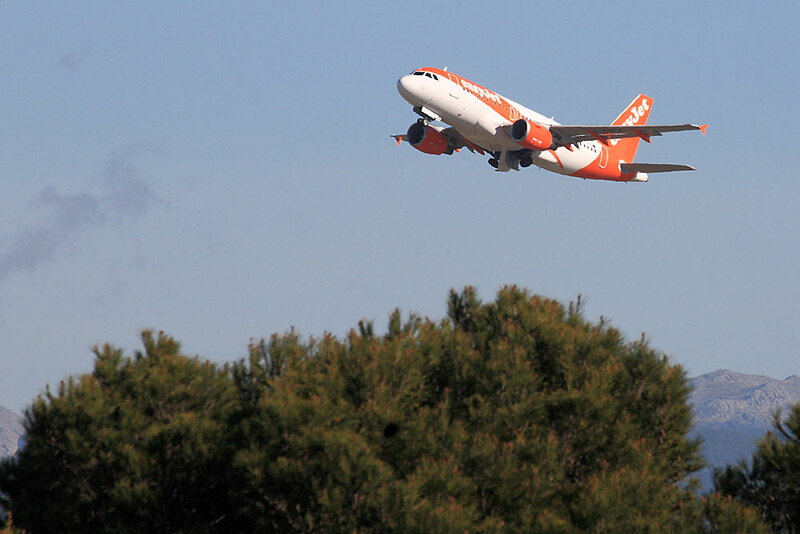 A line of tall trees creates an obstruction, increasing markedly the lower down your room is. 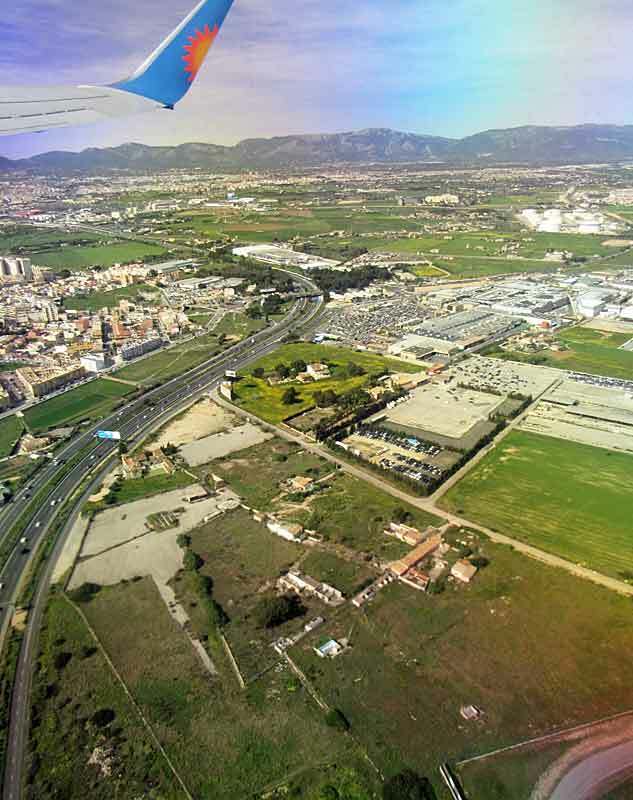 The above view shows the eastern aspect of the Marina Luz, where the entrance is. 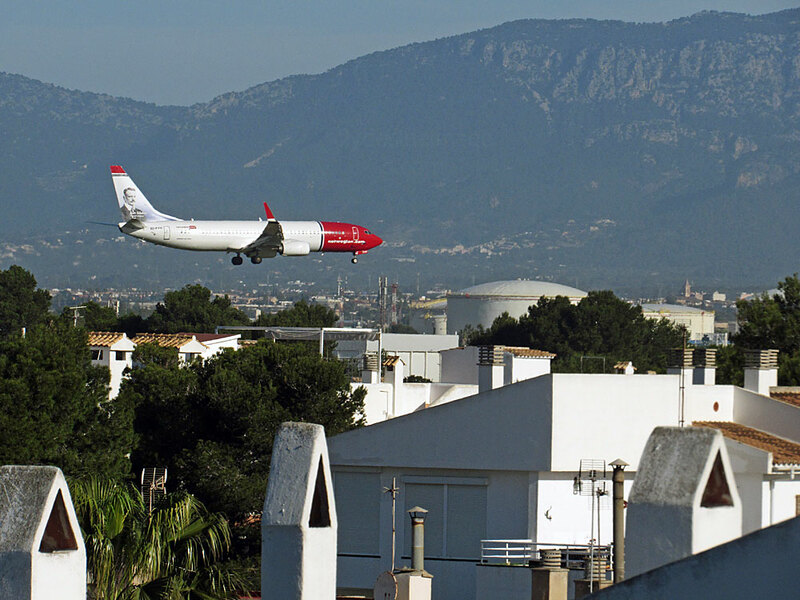 Rooms on this side overlook the pool but you won`t see many planes. 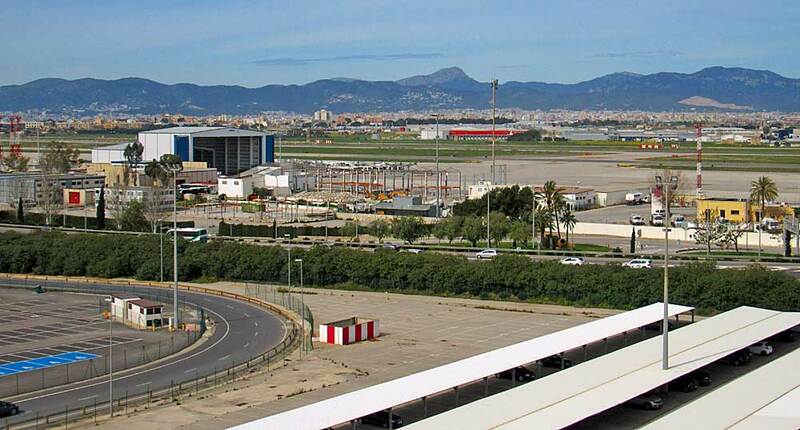 ​A window at the end of the corridor on the 5th floor offers a view which looks onto the Globalia hangar, the multi-storey car park and control tower. 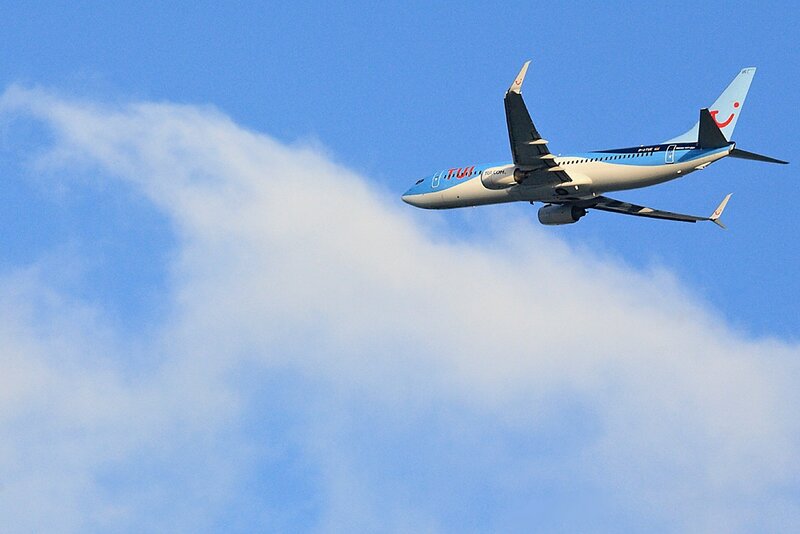 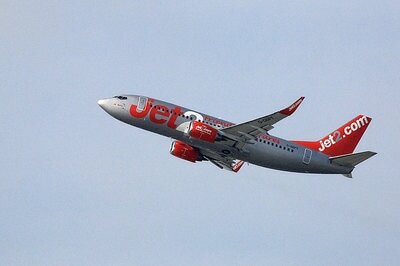 It isn't great but you can also see aircraft on finals for 24L in the distance. 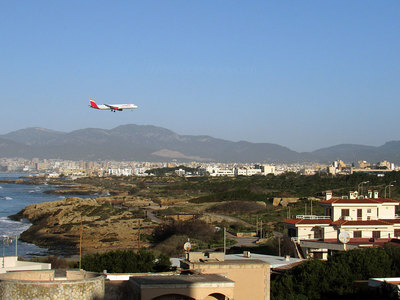 A couple of other hotels in the resort, set further back from the coast, actually offer closer but still partial views of the airport complex. 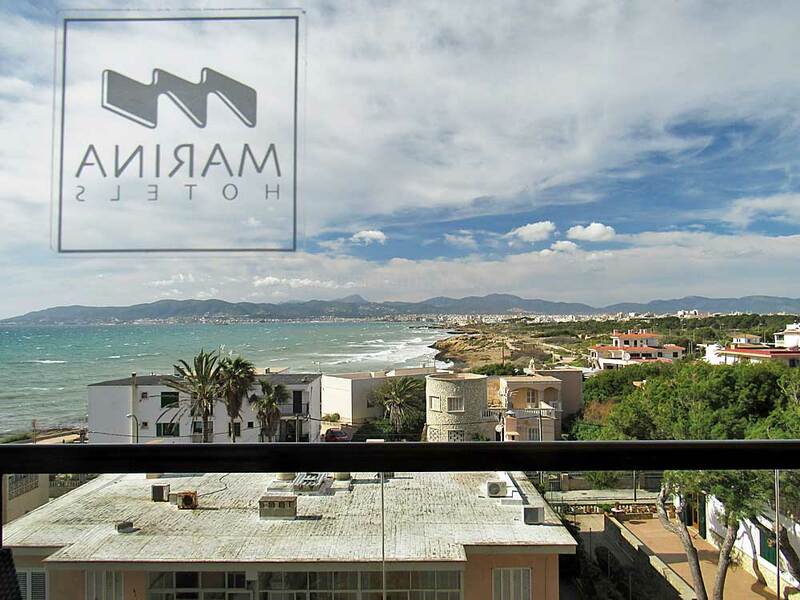 The Marina Luz, which has recently been renovated, is a 4-star 'adults only' establishment with a pool, sauna, jacuzzi and tiny fitness centre and offers free Wi-Fi. 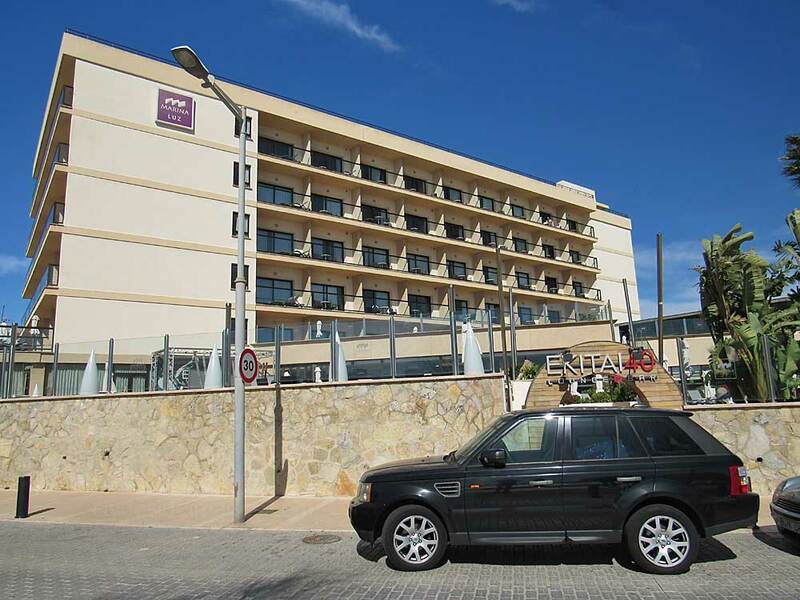 Our room was comfortable and although the buffet breakfast was good, we didn't dine in the hotel, preferring to try some of the numerous eateries in Ca'n Pastilla. 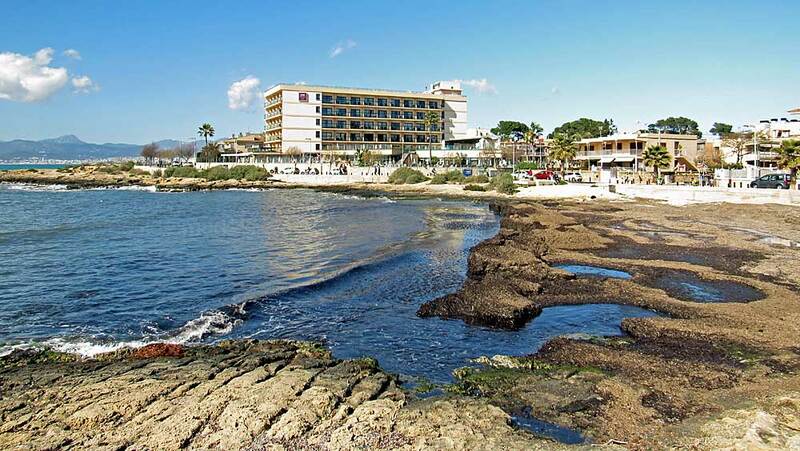 It turned out that the resort was far quieter than expected and many of the few bars and restaurants open at this time of year were deserted. 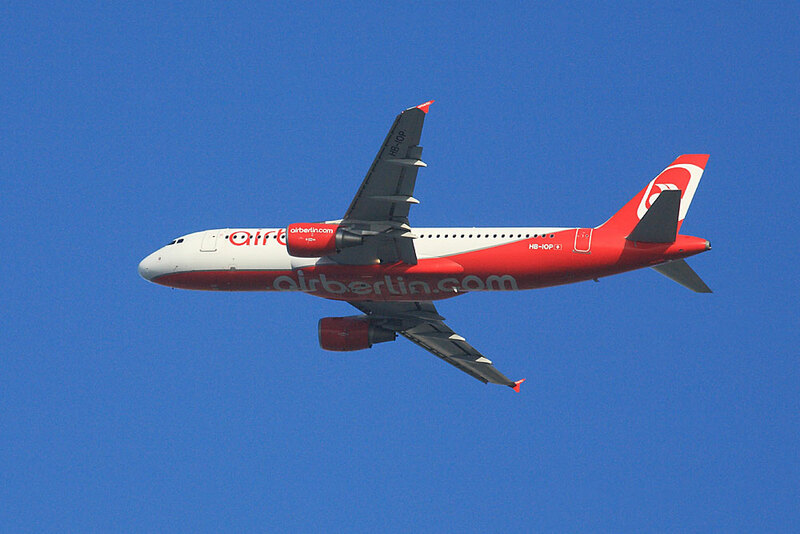 Visibility improved on our second day and overall the weather during the week was bright but breezy, unfortunately blowing in from the southwest for most of the time which meant that all approaches, apart from a couple of hours one morning, were made from the north rather than seeing the aircraft low down on finals in front of our balcony! 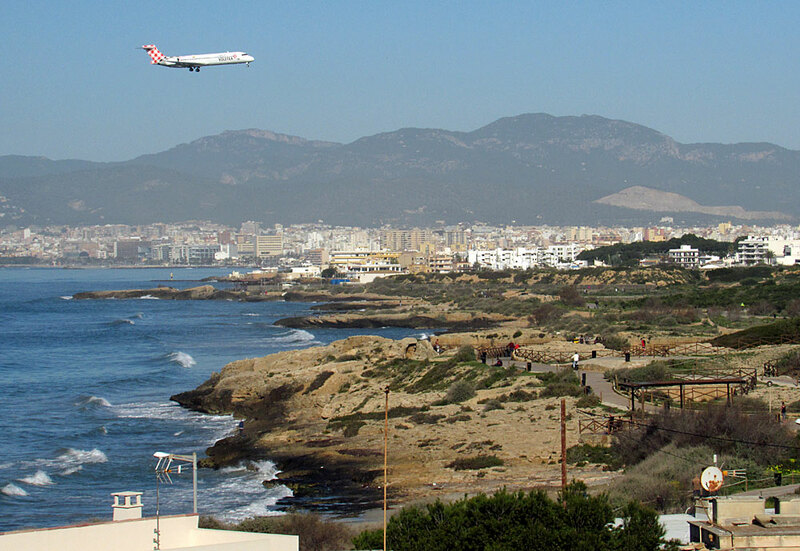 Just a few hundred metres along the paved coastal path / cycle-way to the west of the Marina Luz is a raised area with a shelter and benches, a popular spot for watching and photographing incoming flights when the appropriate runway is in operation. 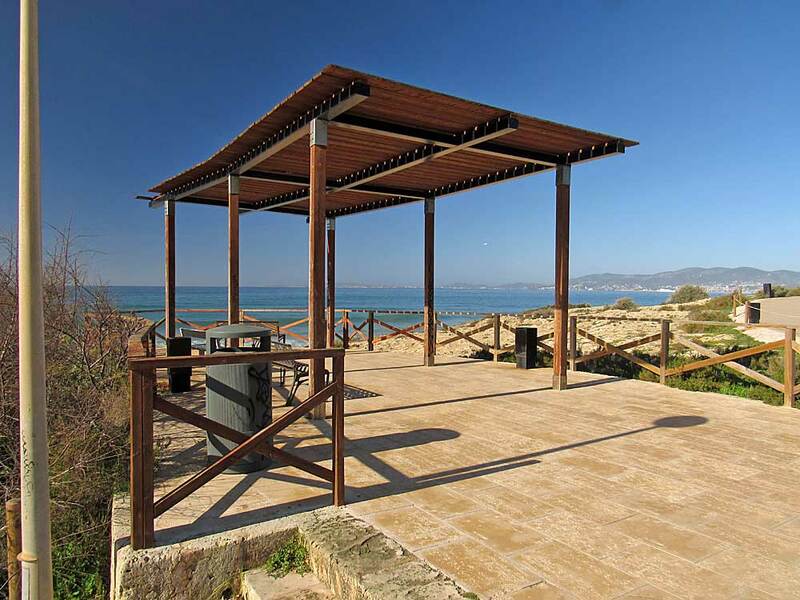 There are old defence works hewn from the rocks including artillery emplacements. 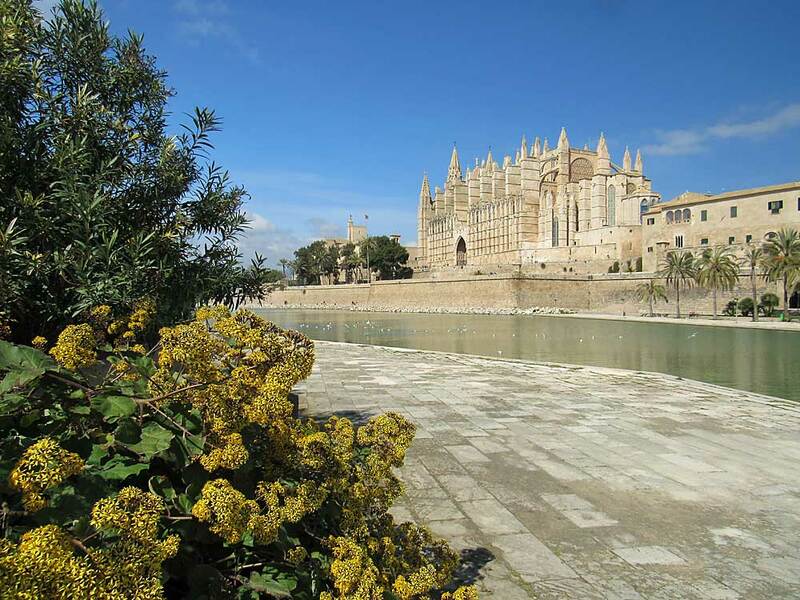 The first guns were positioned here in 1691 when Spain was at war with France but in the late 1800s, longer range 240mm naval artillery pieces were installed to protect Palma Bay. 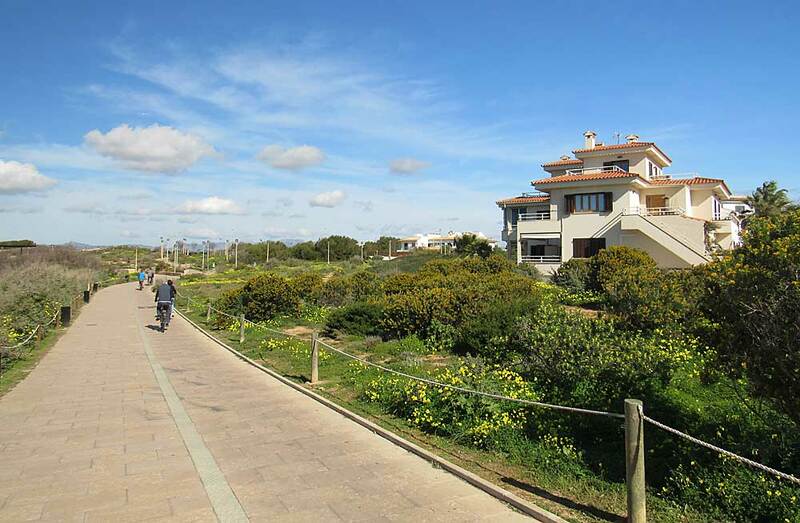 When Spain went to war with the USA over the possession of Cuba and the Philippines in 1898, timber and earth revetments were built here and at various locations along the coast. 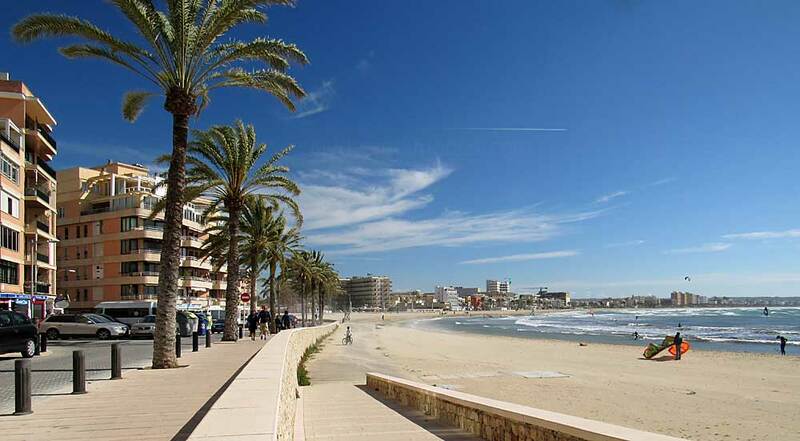 Majorca was not attacked but Spain was defeated within six months, losing the aforementioned territories. 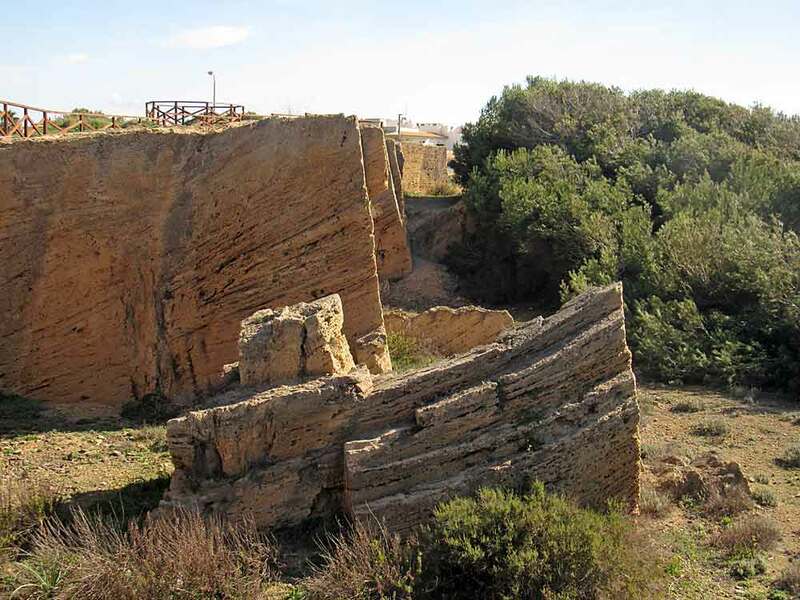 Improved trench lines and permanent underground barracks and storerooms were completed at Ca`n Pastilla (Torre d`en Pau) shortly before the outbreak of World War 1.​ The sculpted rock above reminded me of a trawler - must`ve had too many San Miguels! 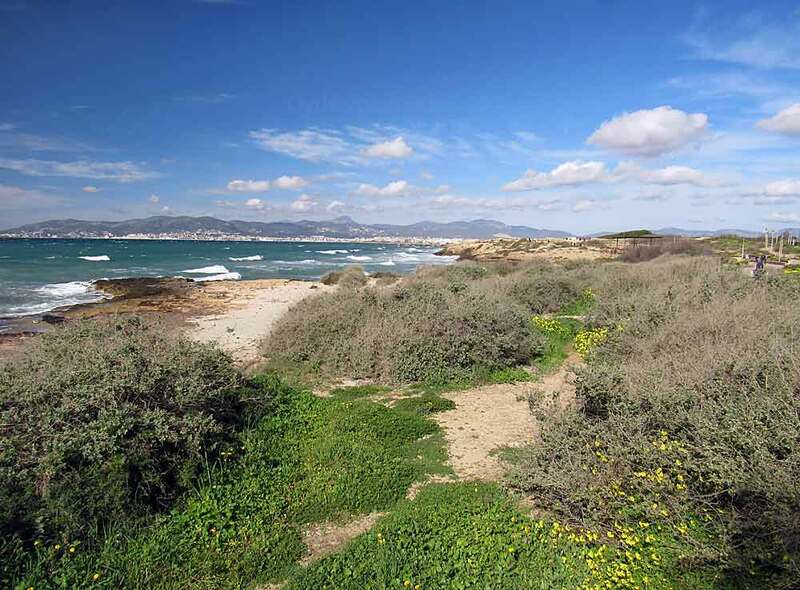 The shoreline and adjacent scrubland along this stretch looked like it had potential for birdwatching with Egret, Turnstone, Redstart, Stonechat, and various warblers spotted. This Kestrel was trying its luck on the Saturday. 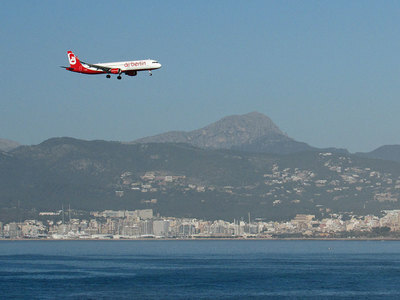 Continuing towards Palma you pass the southernmost end of the '06L' runway lights. 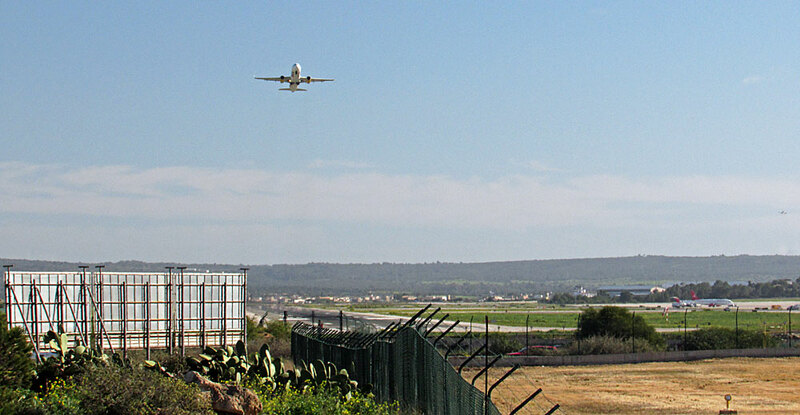 If you stroll over the waste ground on the west side of the fenced area here to a slightly elevated area, you can see planes lifting-off and landing in the distance but the potential for decent shots isn`t great. 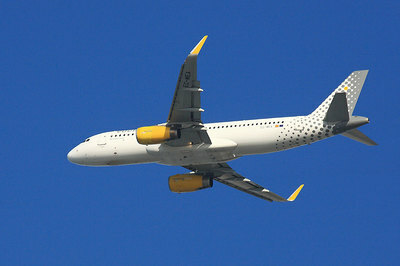 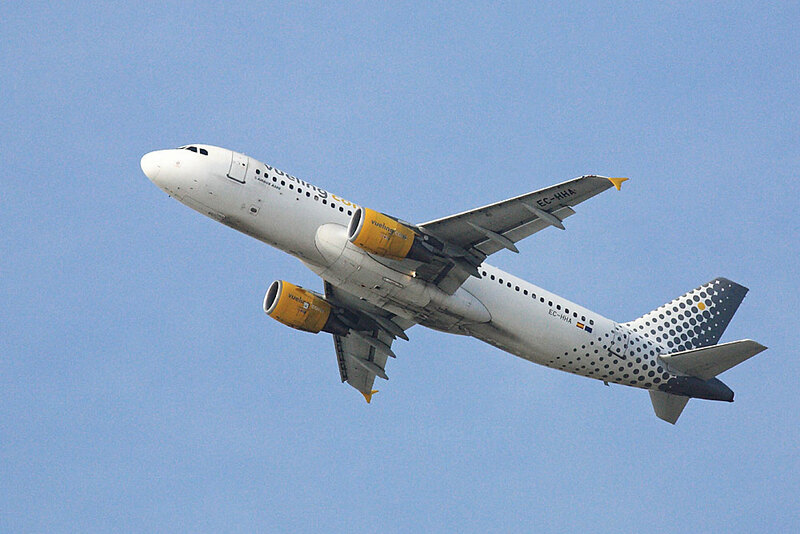 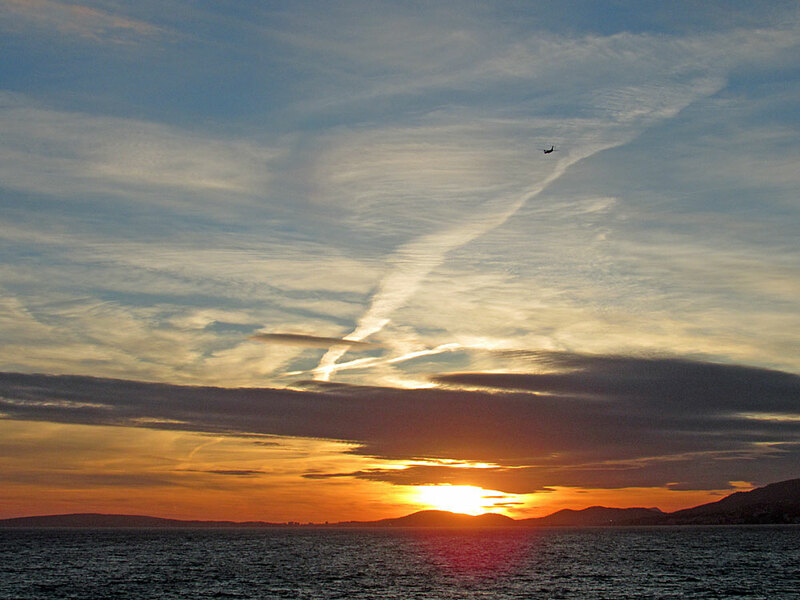 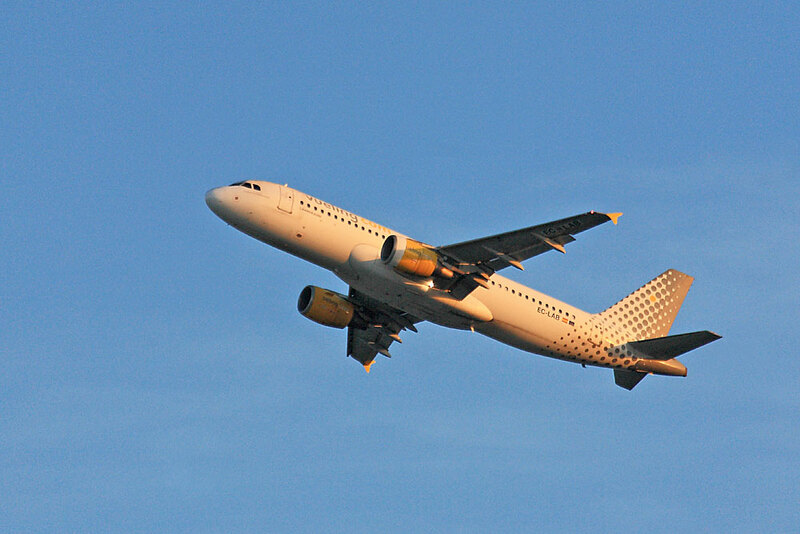 The image below left shows a Vueling Airbus departing `24R` with another airliner on finals barely visible on the far right. 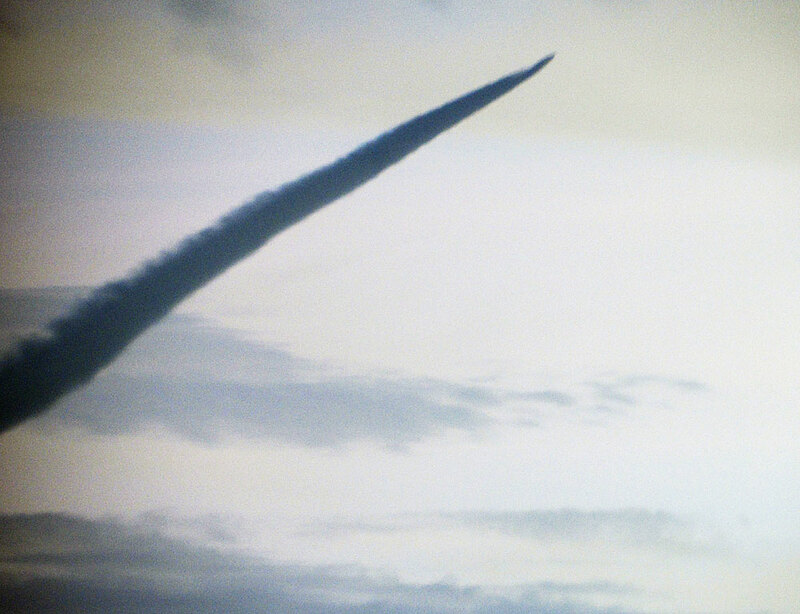 A further zoom-in of the same shot is shown on the right. 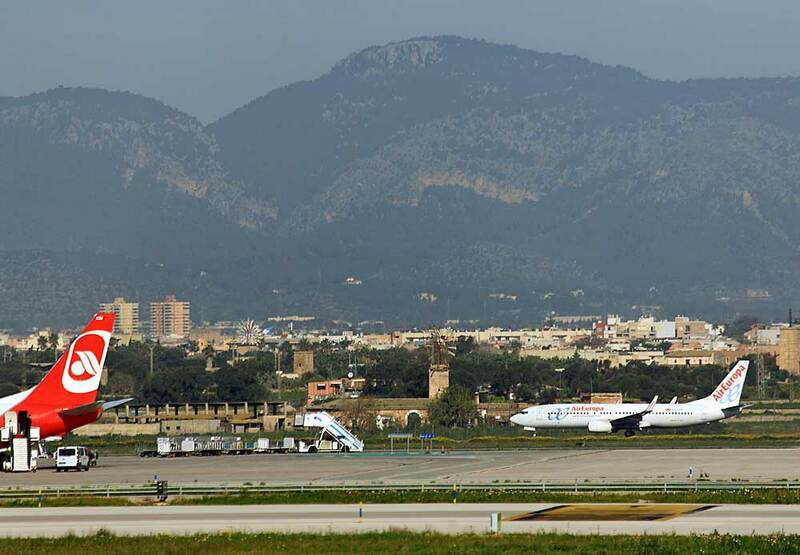 A couple of parking stands are in view but any planes will be too far off for decent photos, plus heat haze may prove problematical. 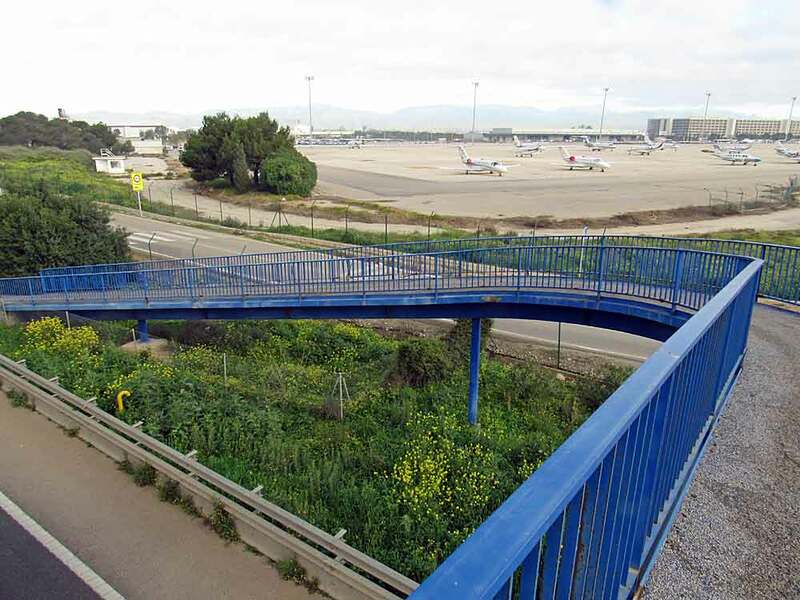 On Thursday 2 March 2017 I hired a bike to check out the photo opportunities along the eastern perimeter of the airport but found the locations a bit disappointing overall, especially for such a large airport. 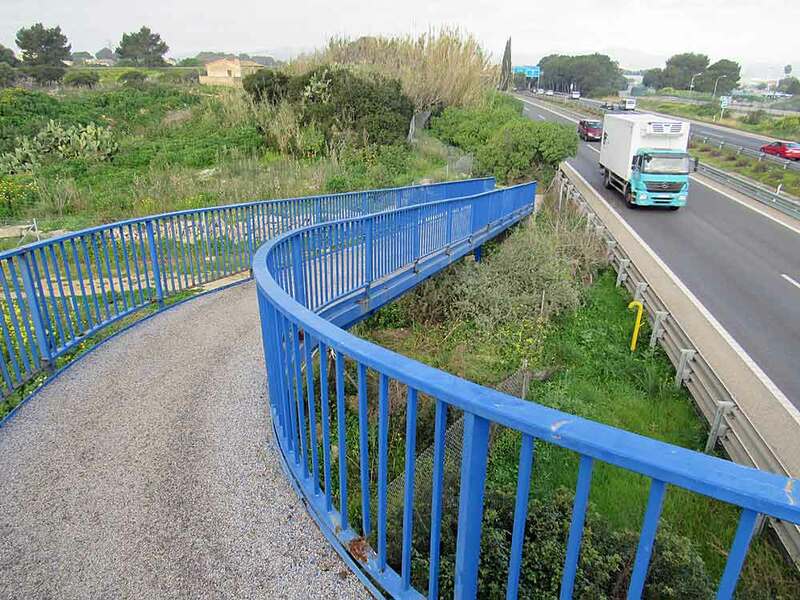 This footbridge, known as the blue bridge (for obvious reasons), which crosses the busy dual carriageway into Palma is easily reached from Ca'n Pastilla, and ideal for seeing what's parked on the biz-jet ramp. 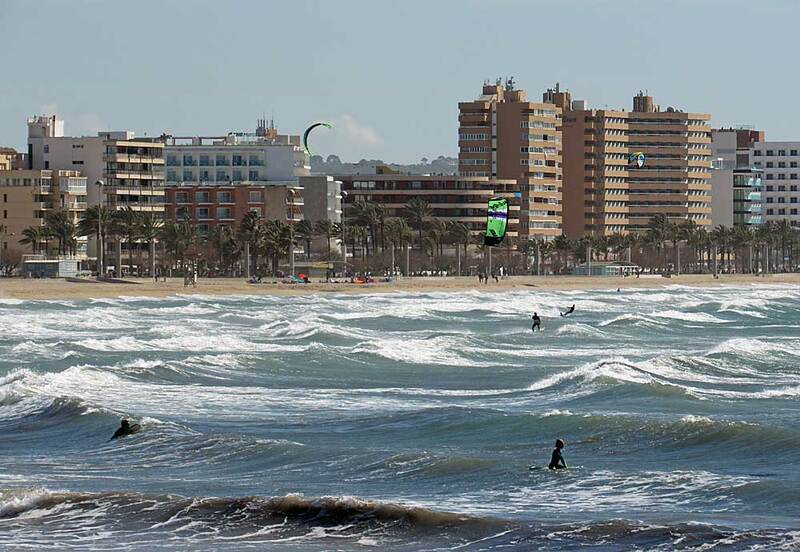 It`s about a 25 minute walk from the Marina Luz or just ten minutes on a bike. It`s also possible to photograph a few of the closer aircraft through the fence. 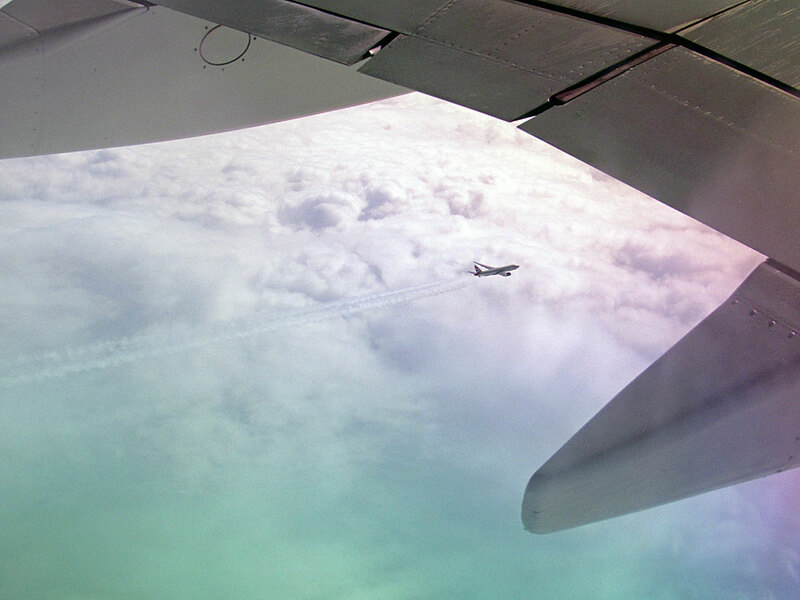 Although I didn`t check it out, the road heading left in the above shot leads to the terminal and passes other spots where additional shots of the biz jets can be taken. 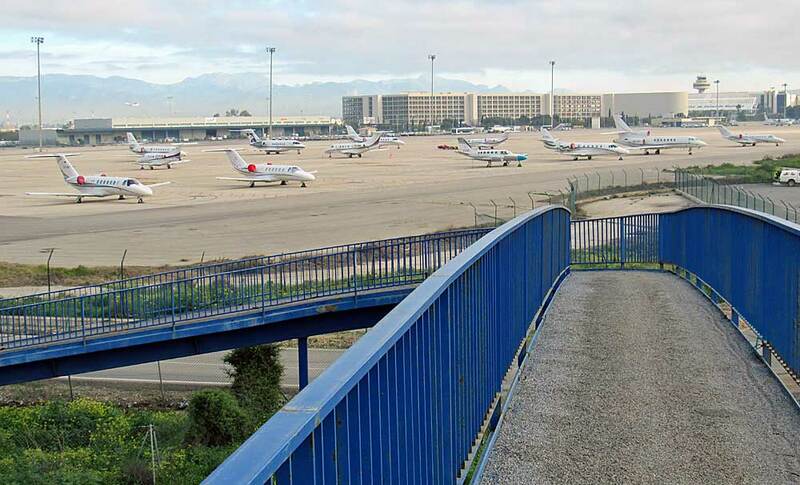 ​Continuing northward, there is a small public park at the southern end of the Son Oms Industrial area with some shots possible through the chain-link fence looking towards the terminal area. 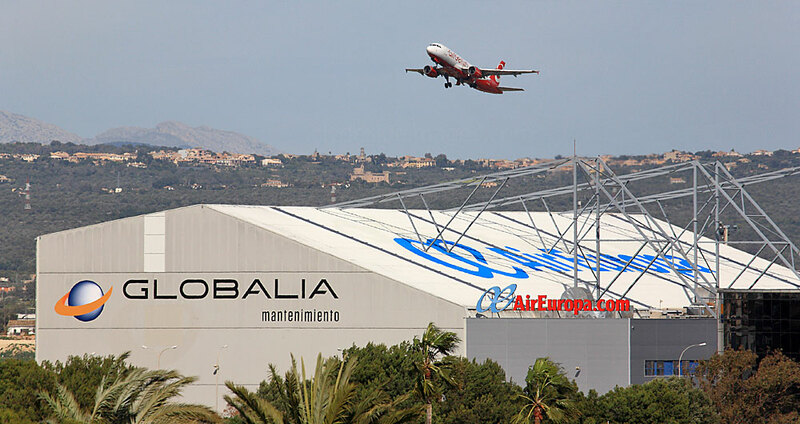 There are supposedly decent views of planes using 6R or 24L from the upper level of a car park above a cafe in one of the industrial park`s buildings but I gave it a miss, especially as plane watchers are reportedly no longer welcome. 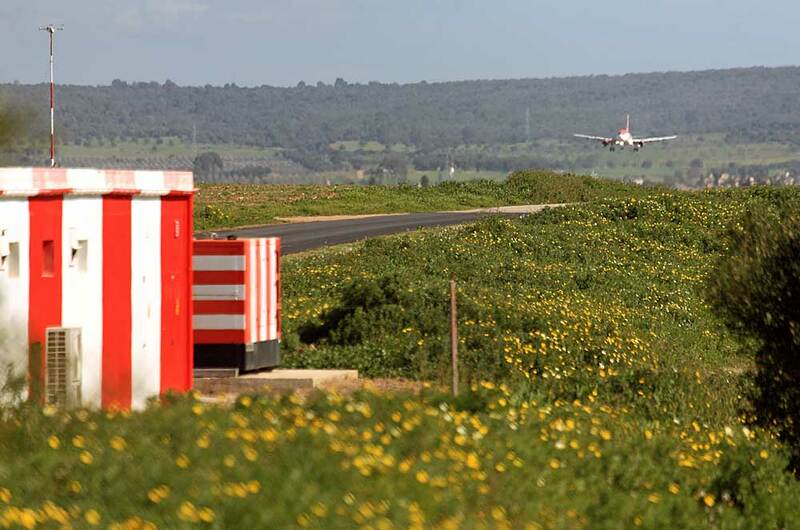 Below: The best-known location for photos on the east side of the airport is the dirt mound which is very close to the perimeter fence and ideally situated if planes are departing via 06R or landing on 24L. 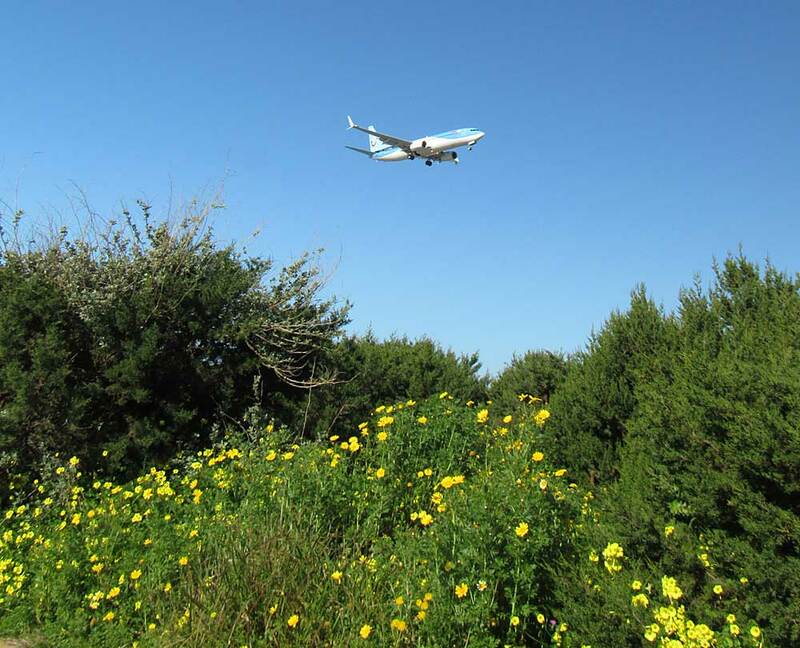 However, unlike the excellent viewing area of the same name at Prestwick, this mound is really just a large pile of rubble, enlarged with fly-tipped wooden furniture, garden waste and assorted junk, now very much overgrown with weeds and other vegetation covering the surface. 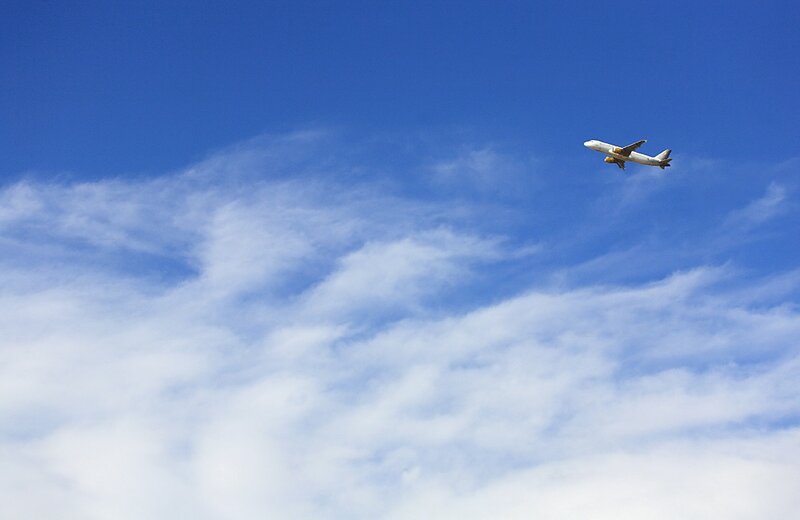 It was possible to stand balanced on a couple of breeze blocks but as they are lying at obscure angles, it's not very comfortable long term. 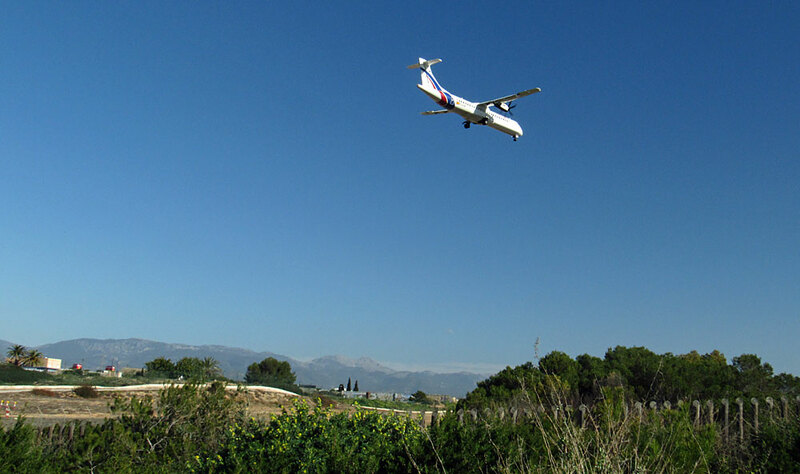 Several aviation websites comment on the presence of snakes here but I didn't see any during my brief stop - it may have been too early in the season, or they may have been staying undercover due to the wasps' nest in one of the pieces of broken drainage pipe! At best, this somewhat precarious vantage point could only accommodate one or perhaps two people at a time. 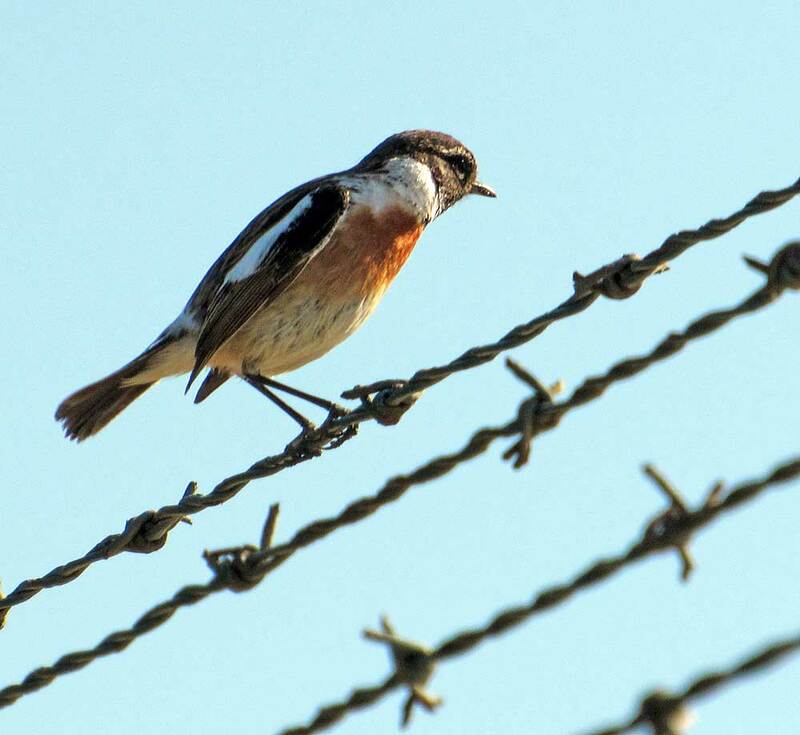 Alternatively, shots can be taken through the adjacent length of fence at a wide aperture, or even better, if your camera lens fits through the holes as the wire is quite thick. 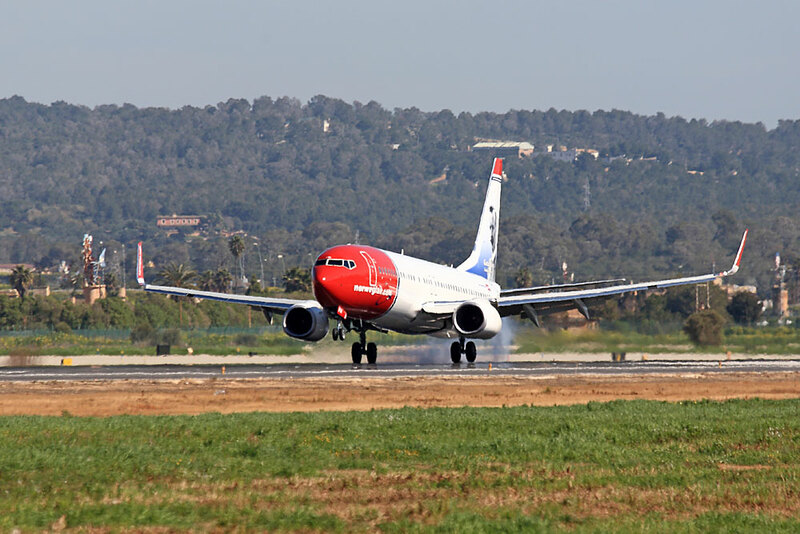 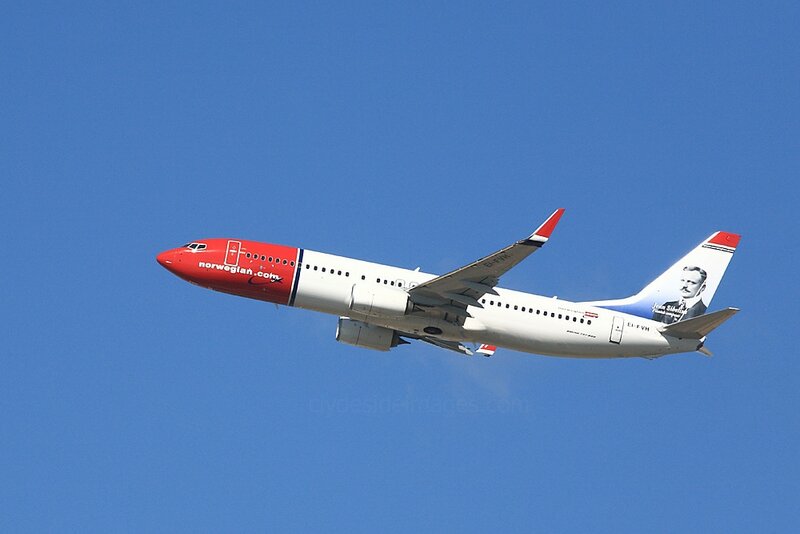 A typical `mound shot`: Norwegian 737 EI-FVI lands on Runway 24L. 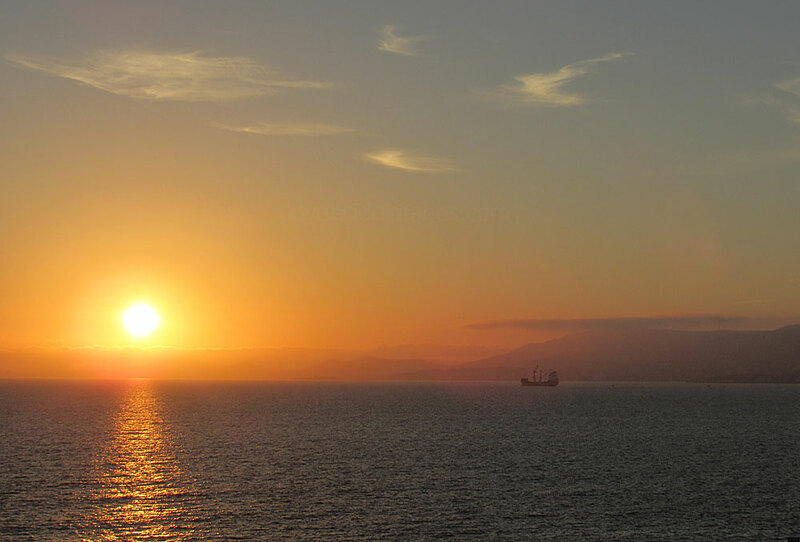 Thursday 2 March 2017. 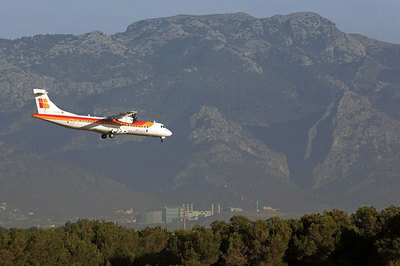 As shown, aircraft on 24L pass very close by and an ex-Spantax Convair CV990, registration EC-BCO, now used for fire training and in a poor state of repair, is visible in the distance. 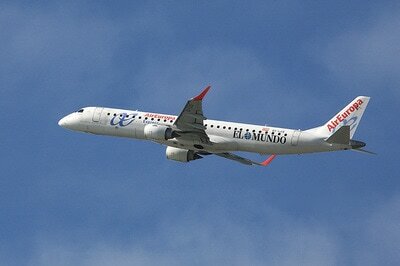 I spent around 90 minutes at the mound location which was long enough, plus things had quietened down by midday. 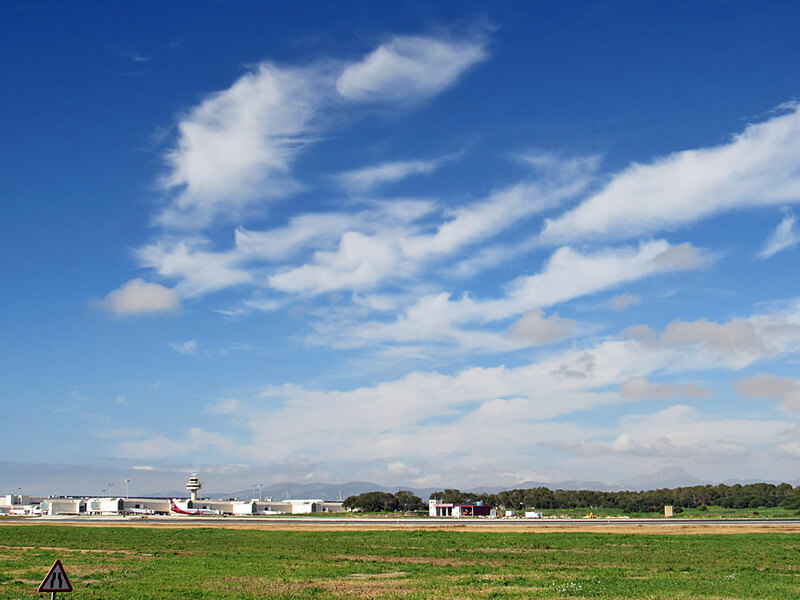 ​To the south of this, almost opposite a small filling station, another track leads uphill past a distinctive radar 'mushroom' to a crash gate but although you are looking across towards the control tower from here, the views are more limited than the mound, and through the mesh gate only. Trees on either side screen landing aircraft until the last minute so you need to be ready to catch them rolling past. 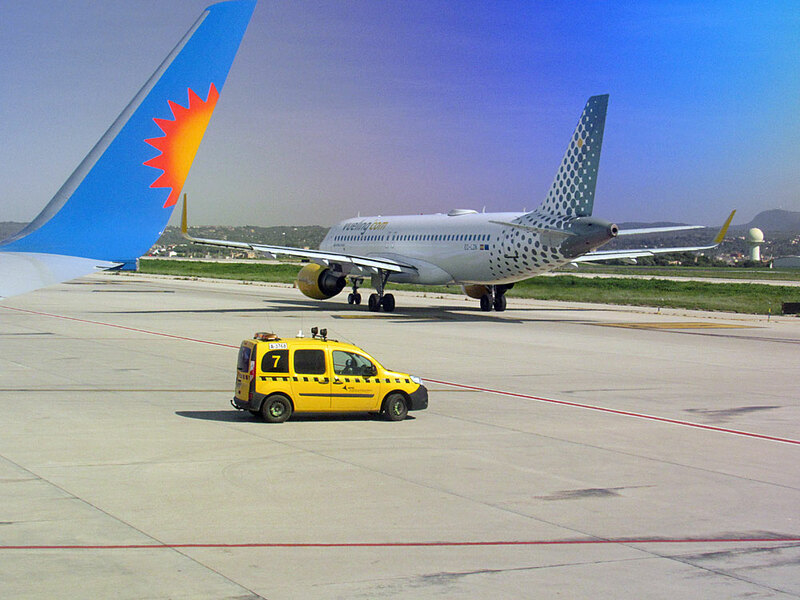 These examples were taken from the crash gate location. The best vantage point on the west side of the airport lies close to a run-down area of housing and various enthusiast websites comment that personal safety could be an issue here therefore caution should be exercised. 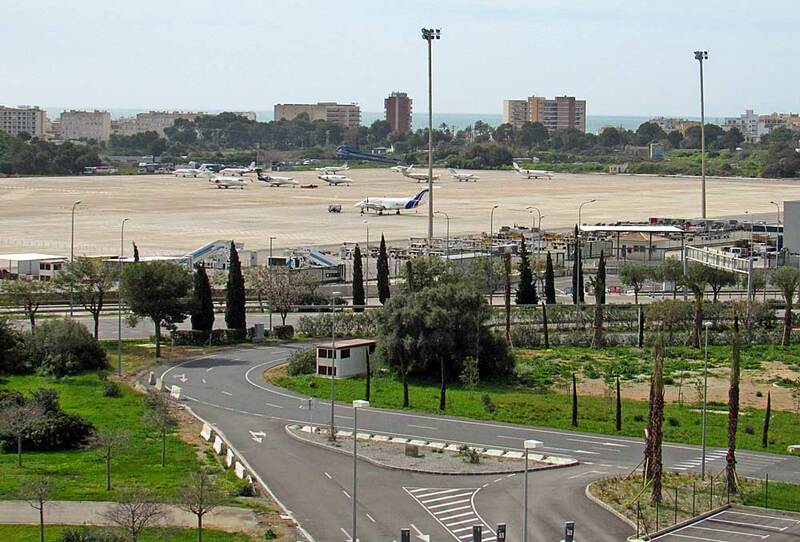 The shot below was taken from the the airport`s multi-storey car park and looks across Runway 06L/24R to the west side of the airport, although the spotting location mentioned isn`t visible. 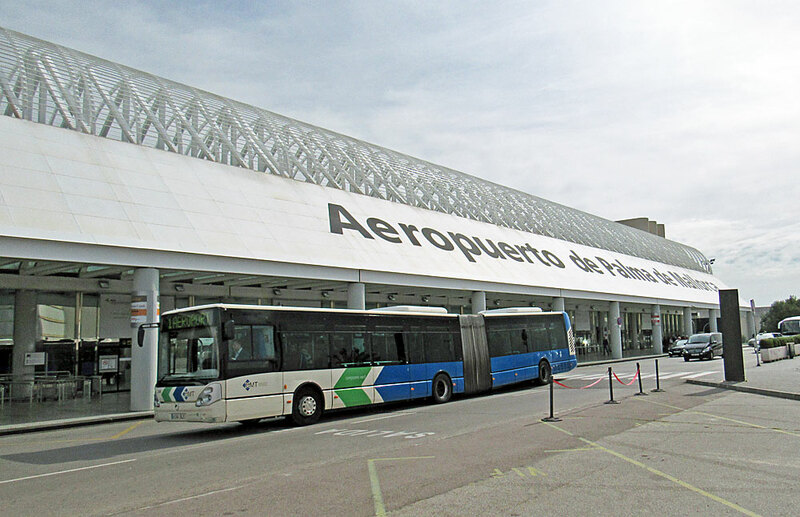 The island`s capital Palma can be easily reached by public transport from Ca`n Pastilla with buses costing just €1.50 Euro each way. They run approximately every 15 minutes and take between 30 mins to an hour depending on traffic. 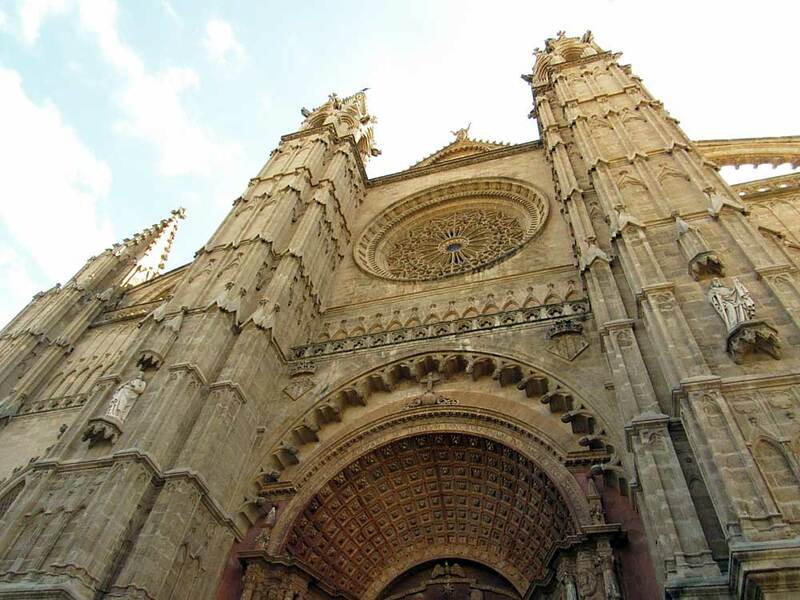 The Cathedral of Santa Maria of Palma, more commonly referred to as La Seu, is a Roman Catholic cathedral built by the Crown of Aragon on the site of a Moorish-era mosque. 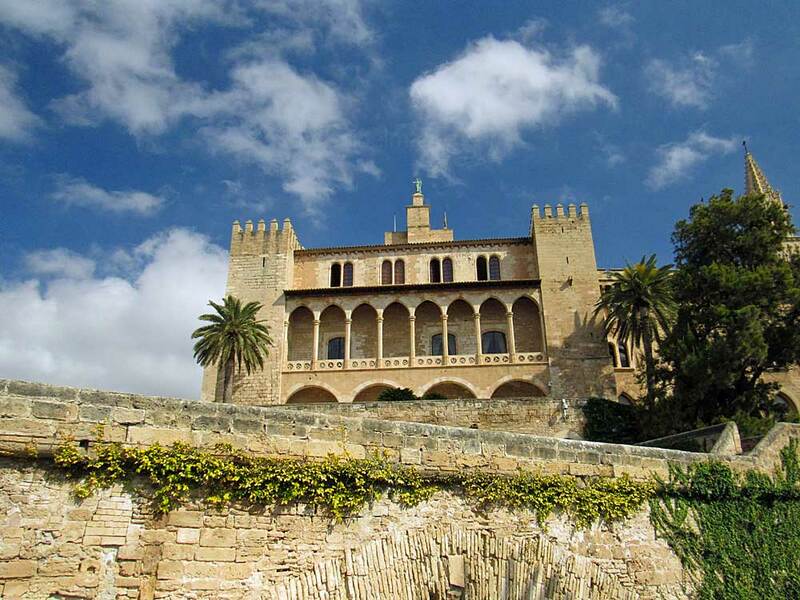 Designed in the Catalan Gothic style but with Northern European influences, it is one of the island`s main tourist attractions. 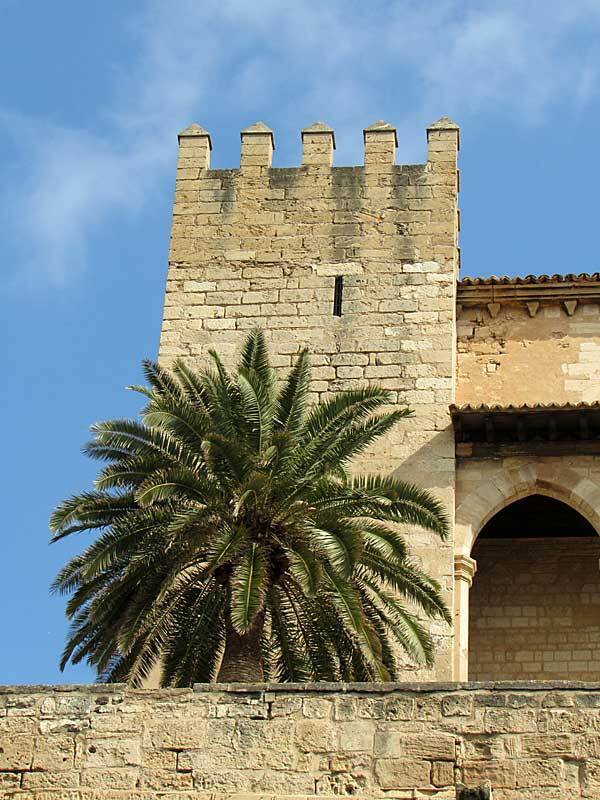 Construction was instigated by King James I of Aragon in 1229 but the structure wasn`t finally completed until 1601. 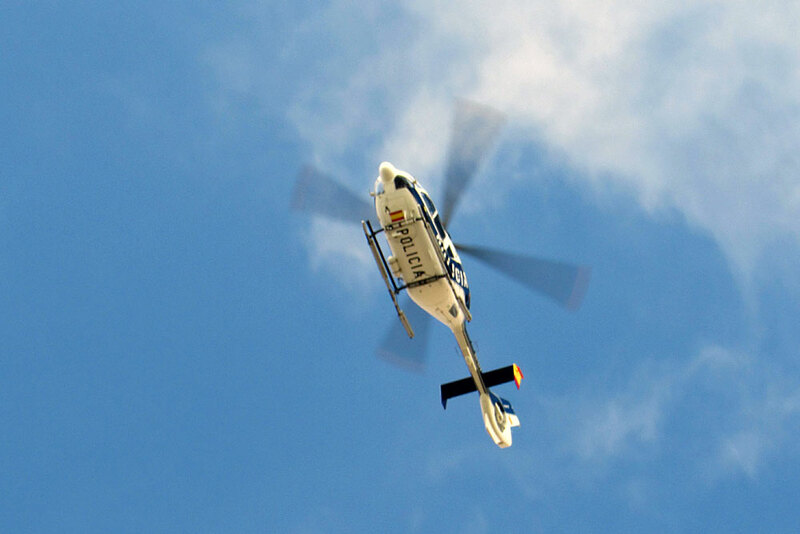 This police helicopter overflew just before I went into the cathedral to check it out. 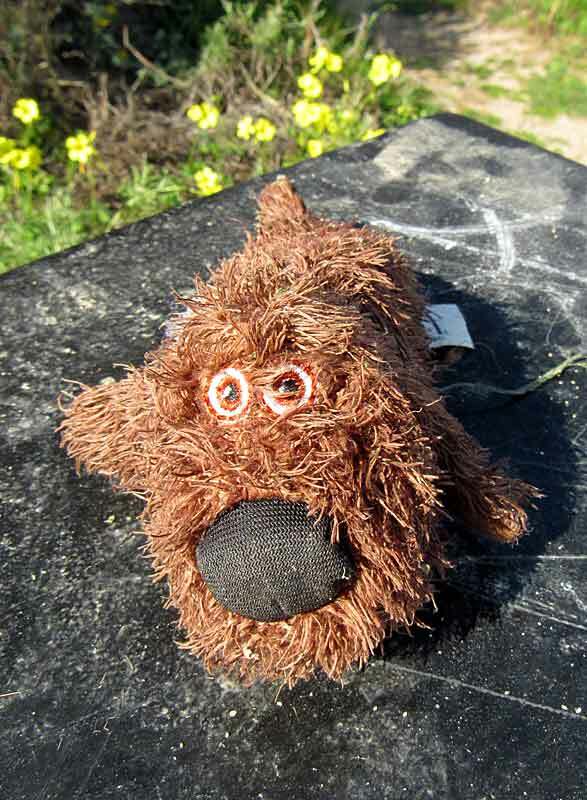 ​Saturday 4 March was a wild day with gusts in excess of 50 mph blasting surf against the rocky shoreline. 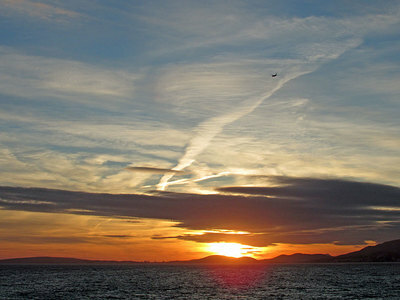 Unsurprisingly, there weren`t quite as many joggers and cyclists on the coastal path! 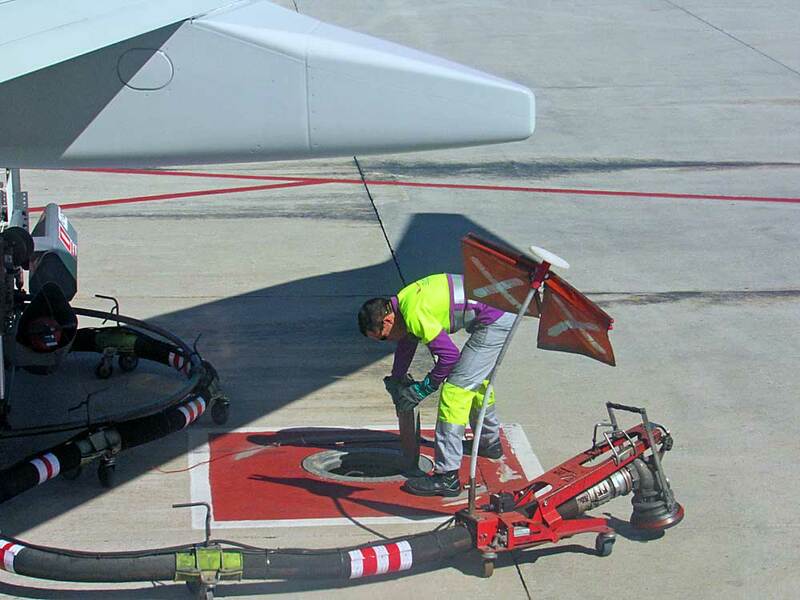 Below: Fuelling up and heading home on Monday 6 March. The following section shows more of the aircraft photographed during the week. As previously mentioned, there`s not a great variety and most are in a similar pose. 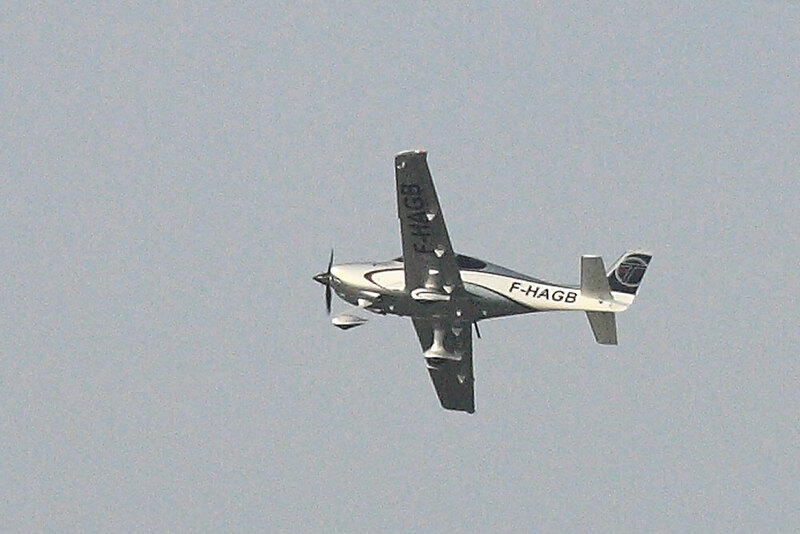 I`ve included some rather grainy, low-res shots of a few smaller planes for record purposes. 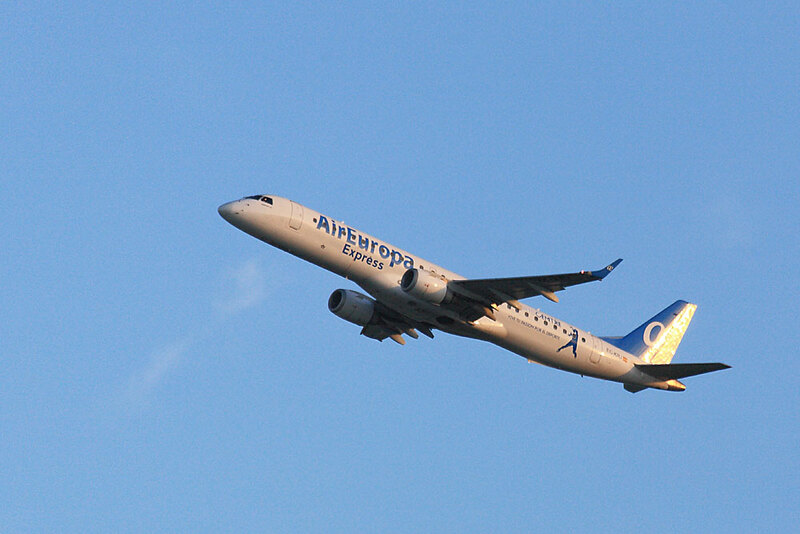 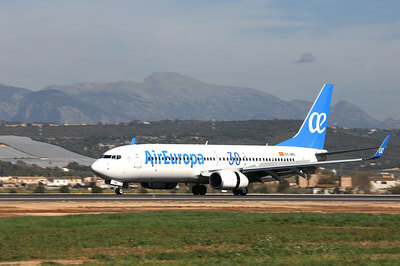 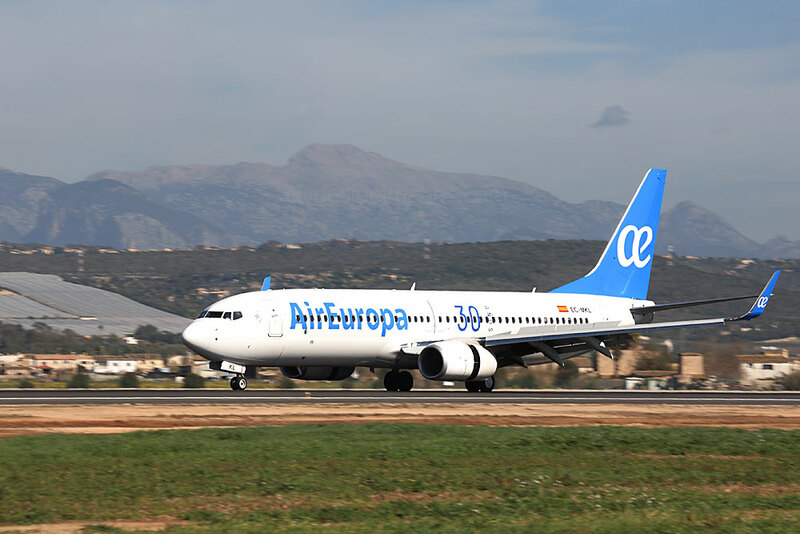 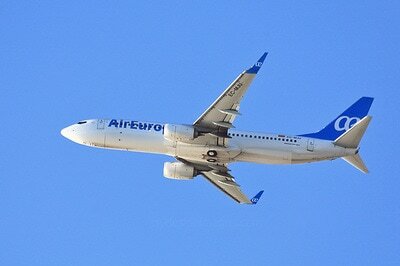 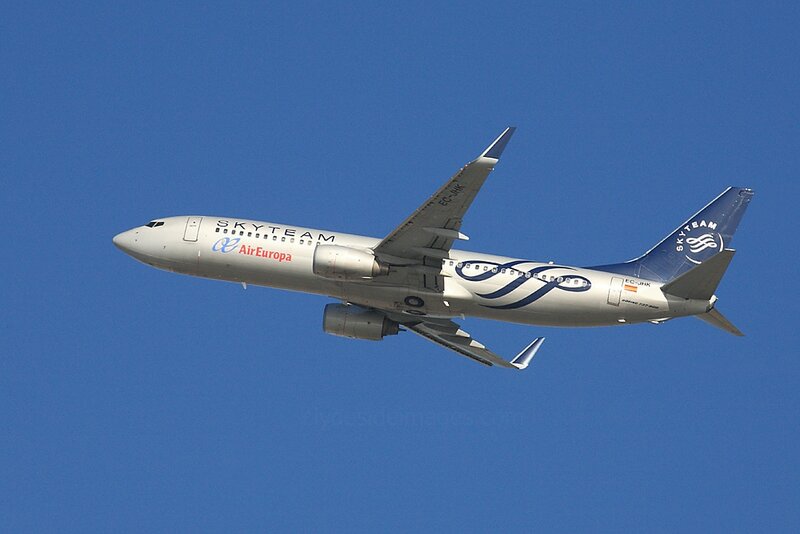 Air Europa Boeing 737 EC-JHK in Skyteam livery , seen here on Saturday 4 March, was heading for Barcelona. 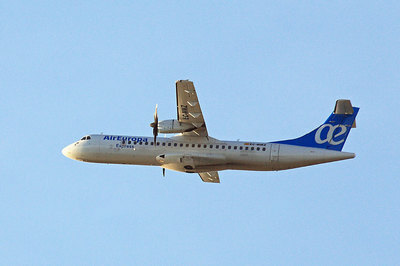 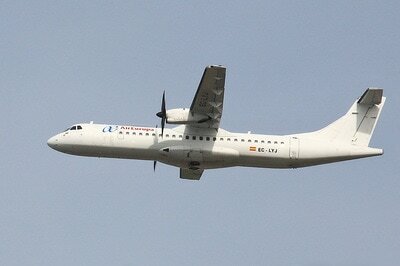 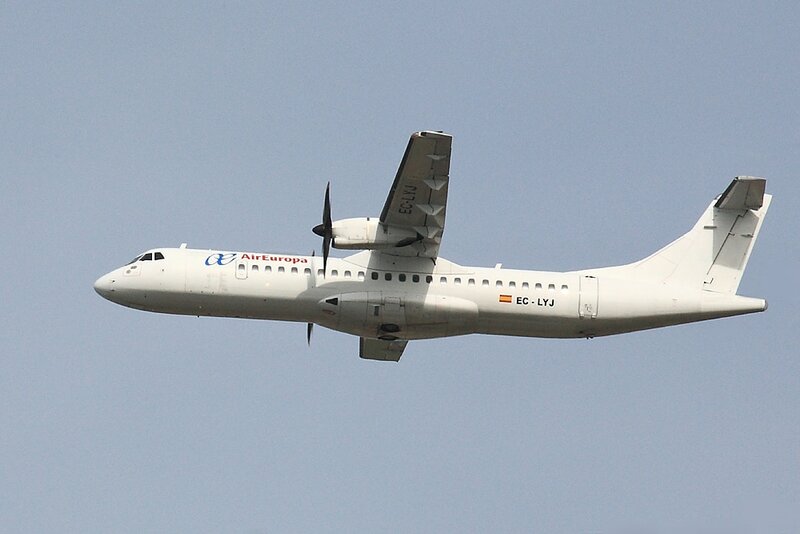 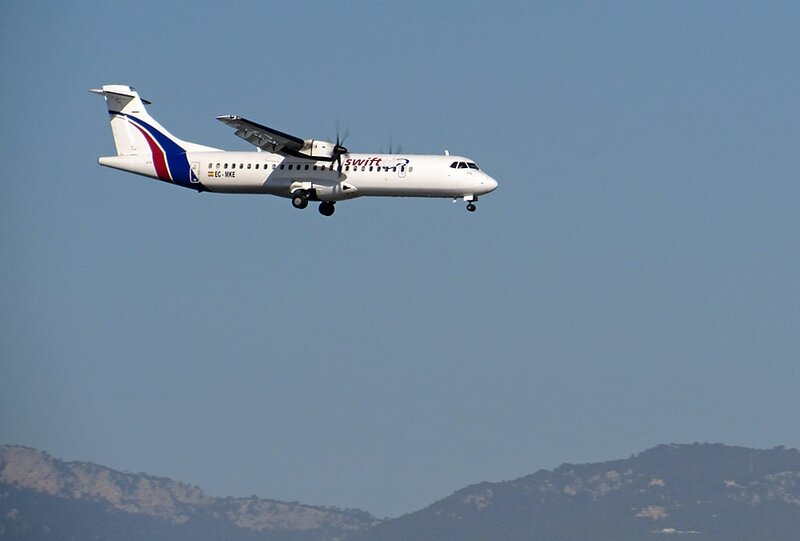 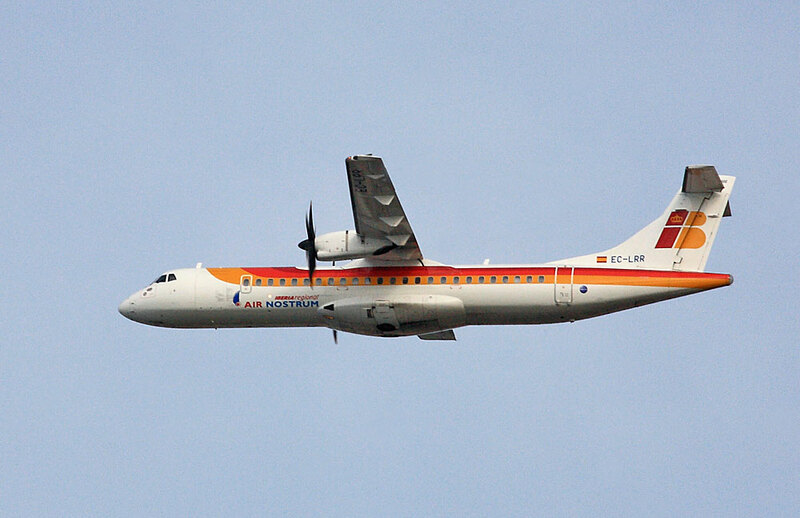 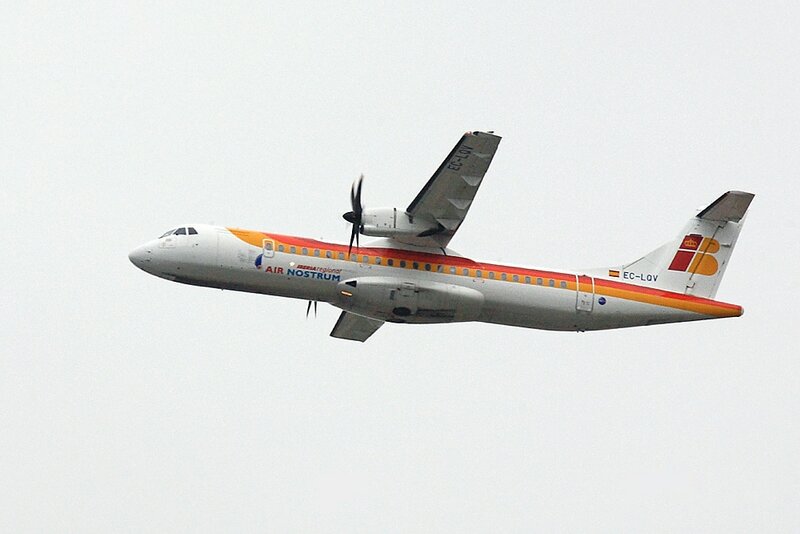 Air Europa ATR 72-201 EC-LST on short finals for 06L, Wednesday 1 March. 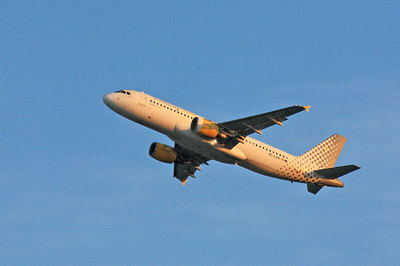 Vueling Airbus A320-232(WL) EC-LZM shot from the mound after touchdown on Runway 24L. 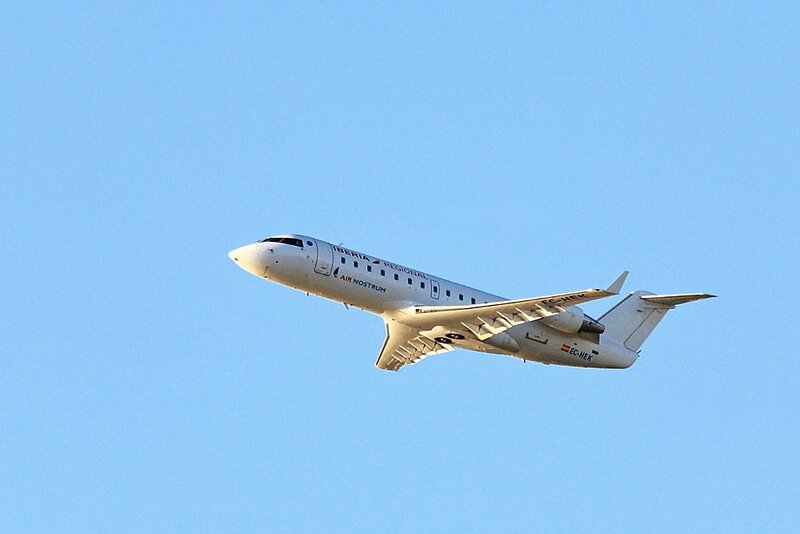 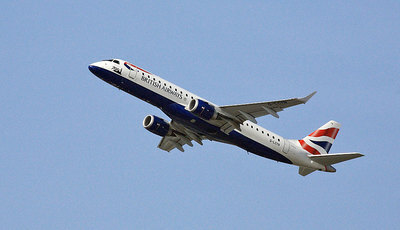 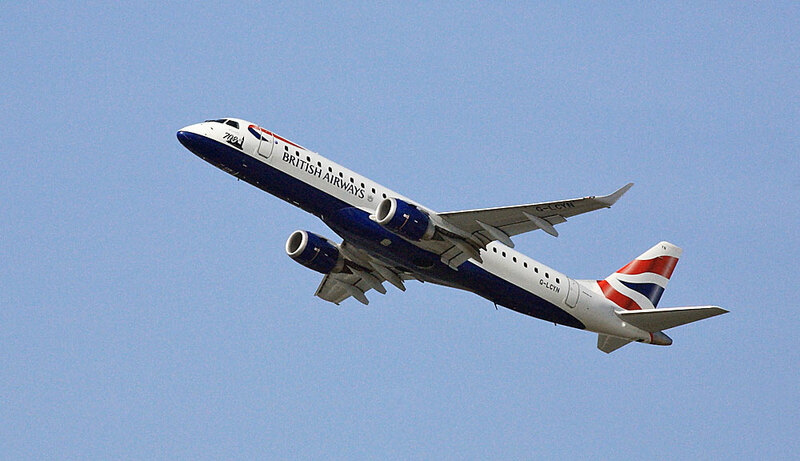 Embraer Emb-190-100SR G-LCYO BA CityFlyer. 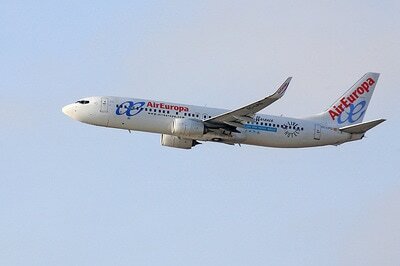 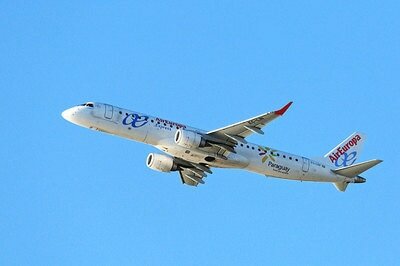 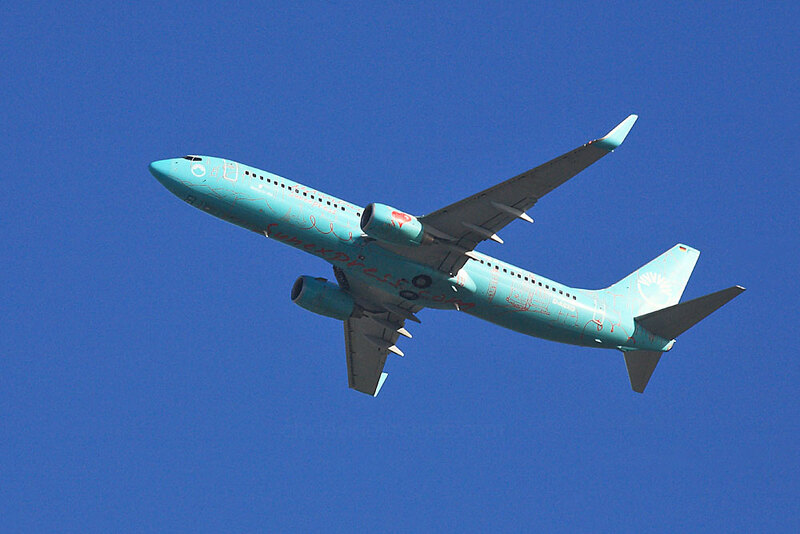 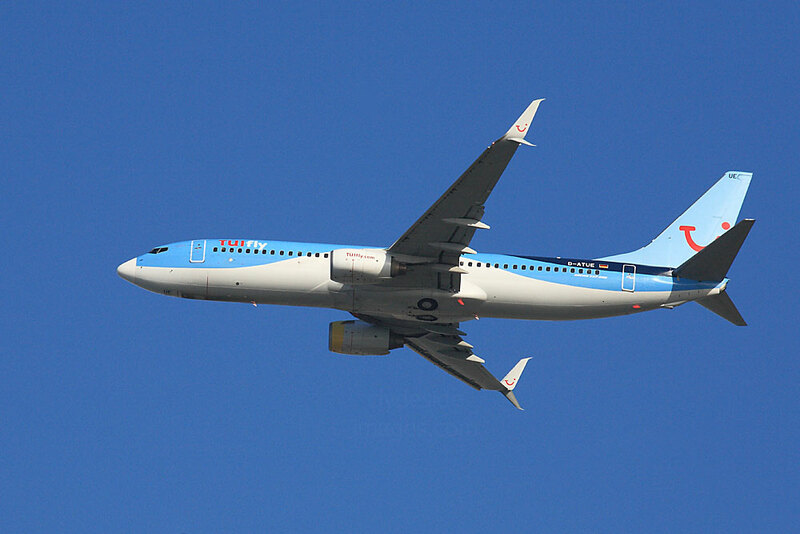 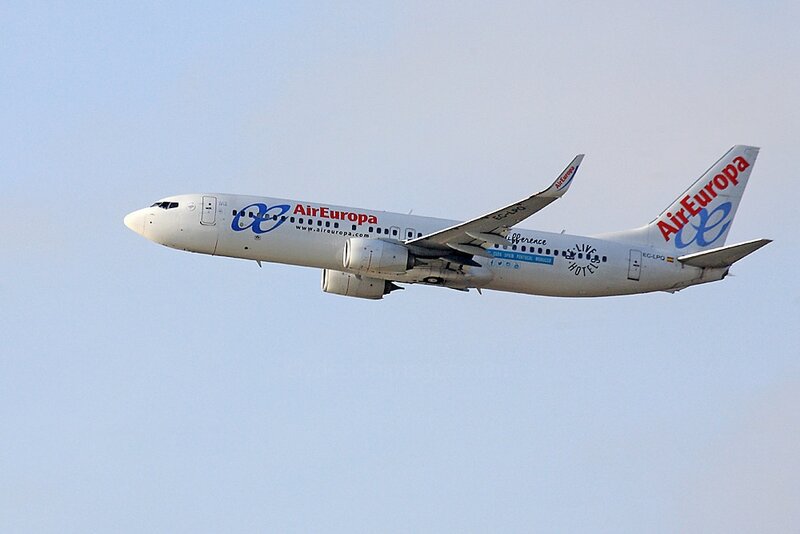 Boeing 737-8HX(WL) D-ASXO in SunExpress Istanbul livery made two appearances on Saturday 4 March. 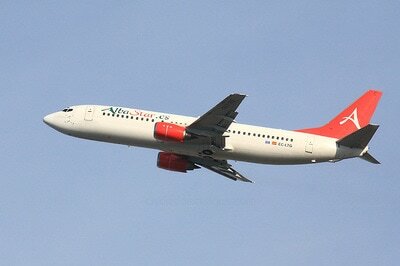 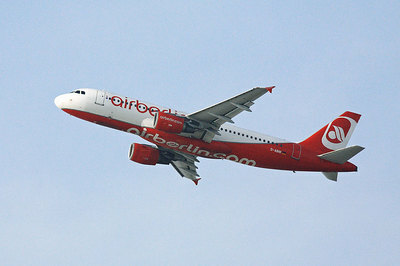 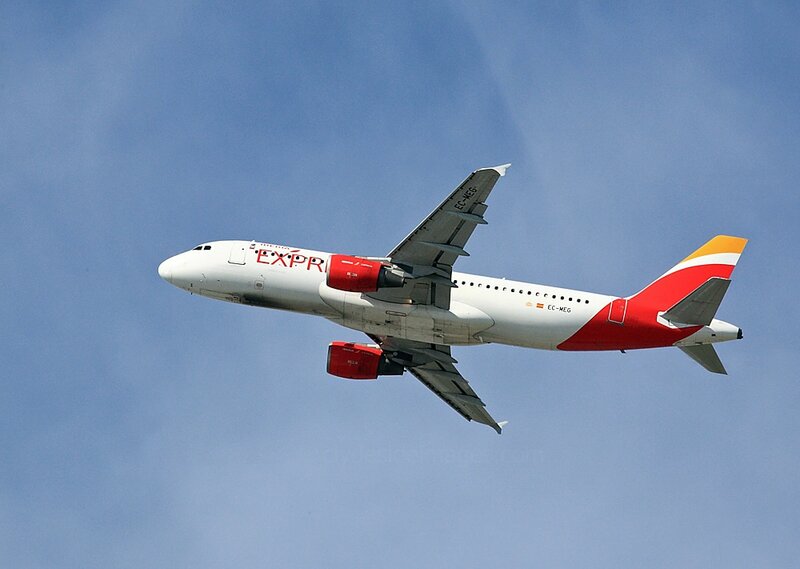 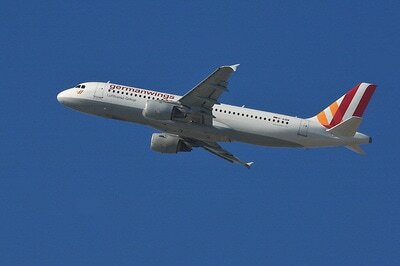 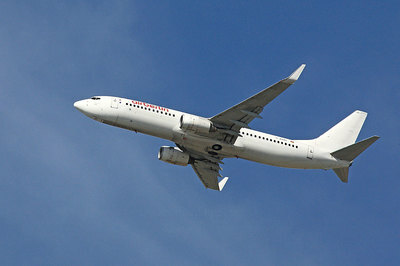 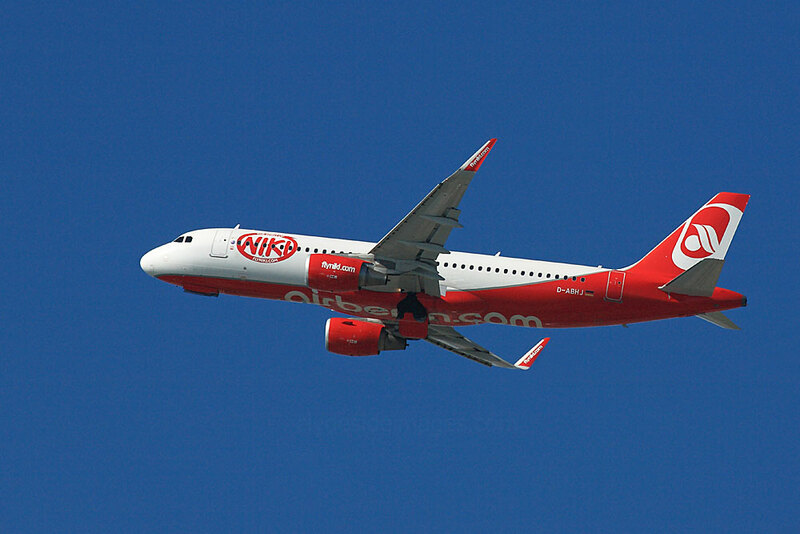 A321-311 D-ASTE was returning holidaymakers to Bremen on 3 March. 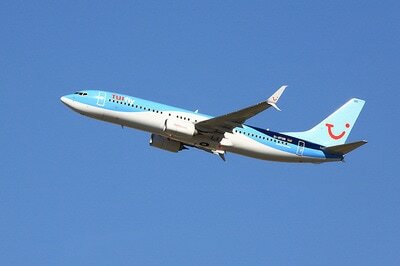 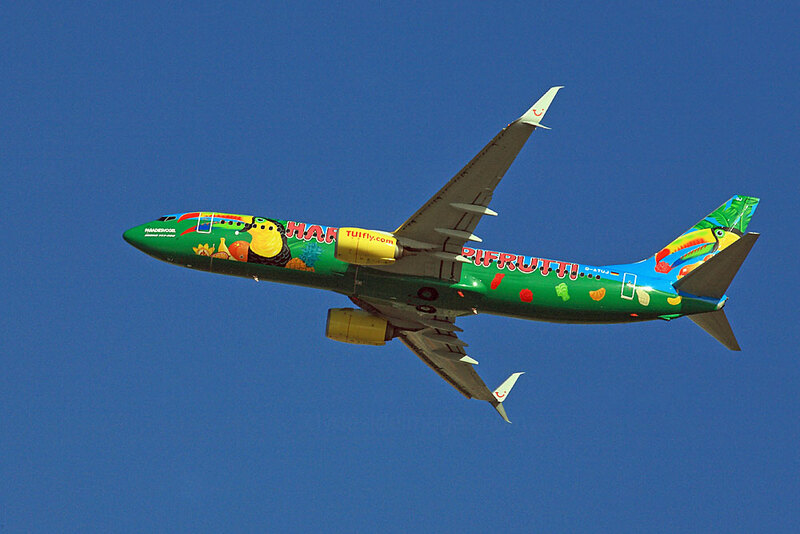 TUIfly`s 737-8K5 D-ATUJ in the airline`s striking Haribo Tropifrutti sweets livery was returning to to Dusseldorf on 4 March. 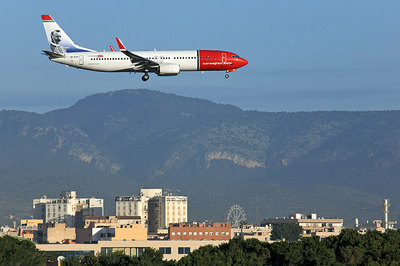 ​Boeing 737-8JP(WL) EI-FVH of Norwegian Air International about to land on `6L`shot from the 4th floor balcony of the Marina Luz. 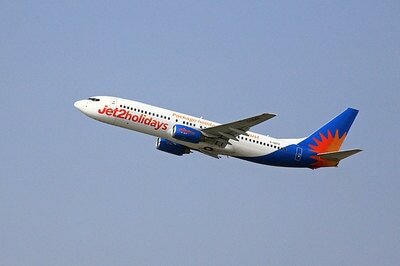 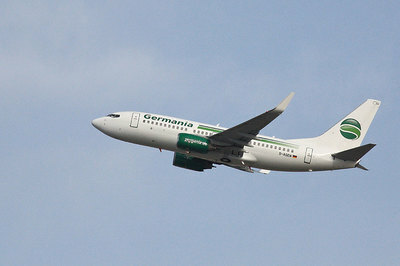 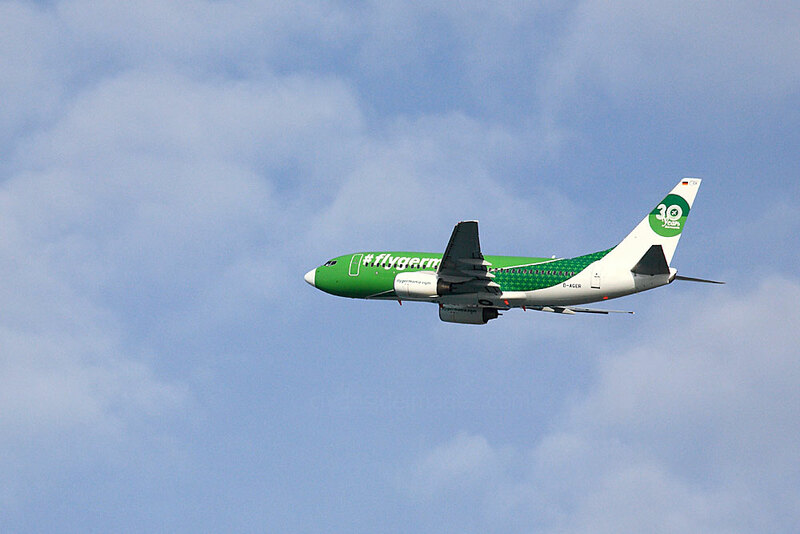 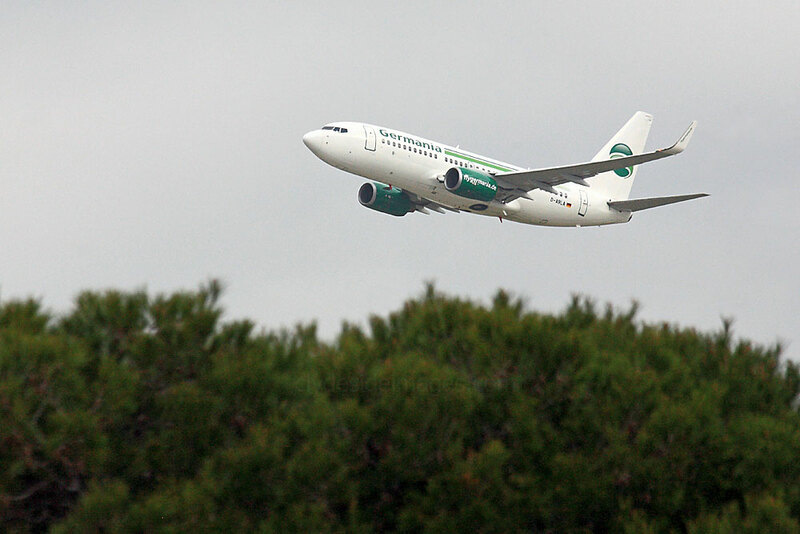 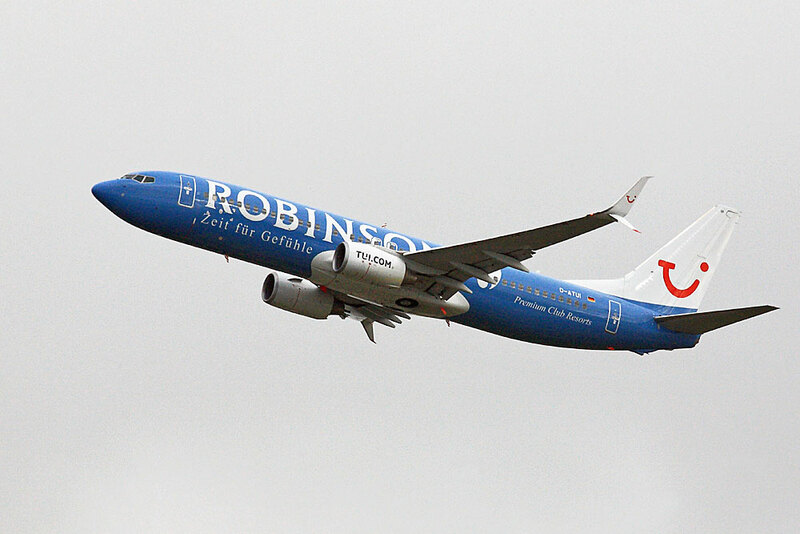 A large number of this airline`s 737-800s bear Irish registrations and commemorate famous people. 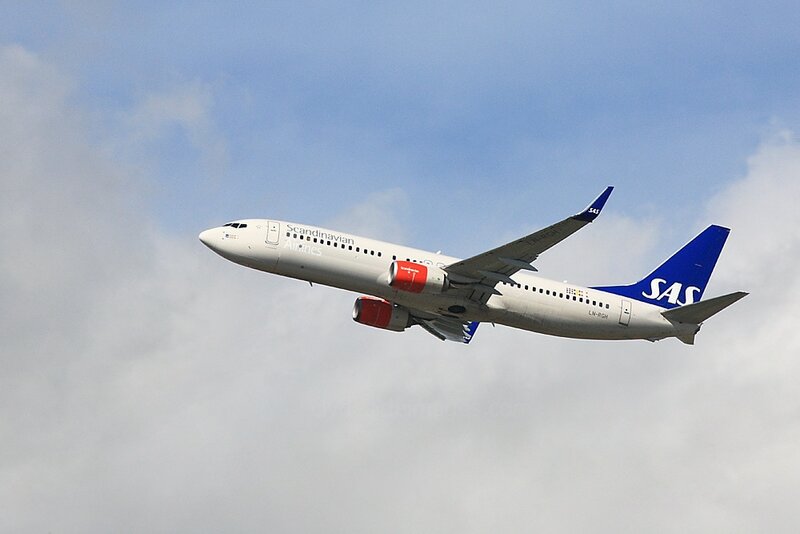 In this case the aircraft`s tail art features Finnish composer and violinist Jean Sibelius (8 December 1865 – 20 September 1957) who is often credited with having helped Finland to develop a national identity during its struggle for independence from Russia. 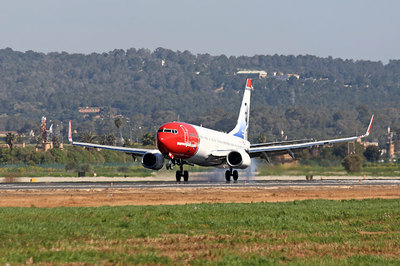 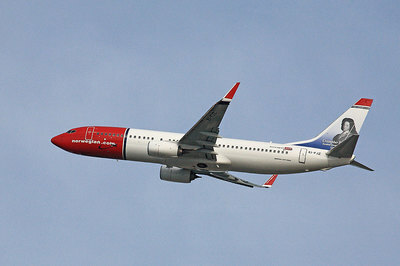 Danish-registered SAS A320-232 OY-KAW was returning holidaymakers to Copenhagen on Sunday 5 March. 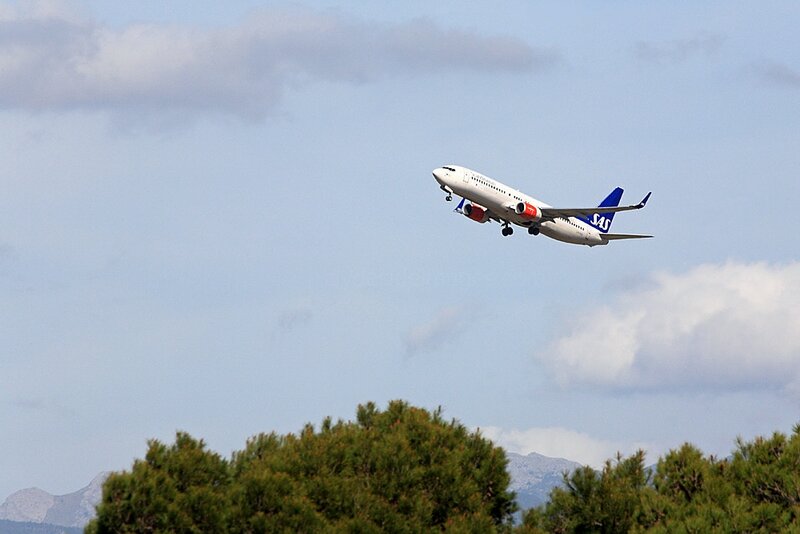 Scandinavian Airlines (SAS) Airbus A320-251N(WL) LN-RGN was bound for Stockholm on 5 March. 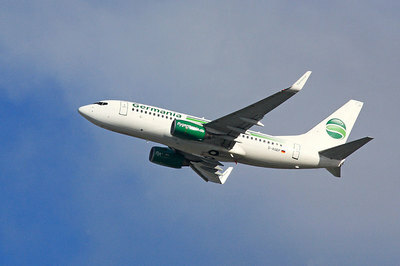 Transavia Boeing 737-8K2 PH-HSF heading back to Amsterdam Schiphol mid-morning on Tuesday 28 February. 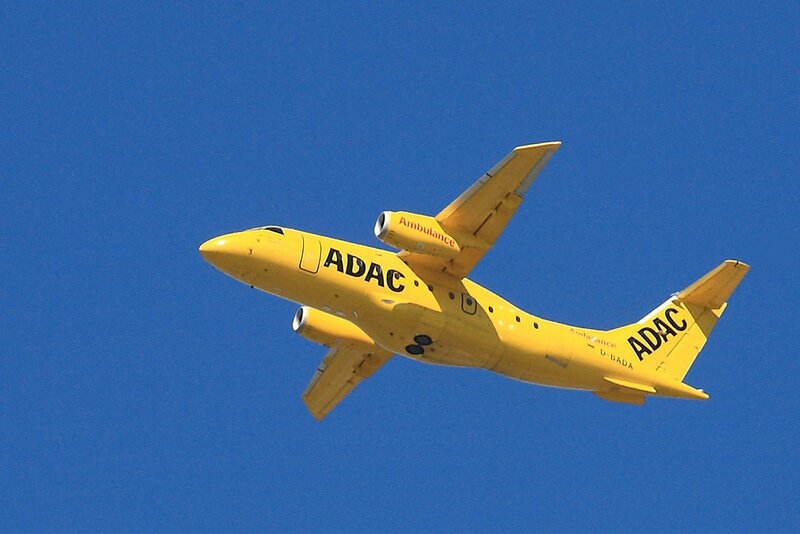 This shot of Dornier Fairchild 328-300 D-BADA was taken from the hotel balcony about 13:00 hrs on Wednesday 1 March. The aircraft is one of a pair operated by ADAC, the German Automobile Club's Ambulance Service. The organisation also has one Super King Air 350 and a Learjet 60XR in its inventory. 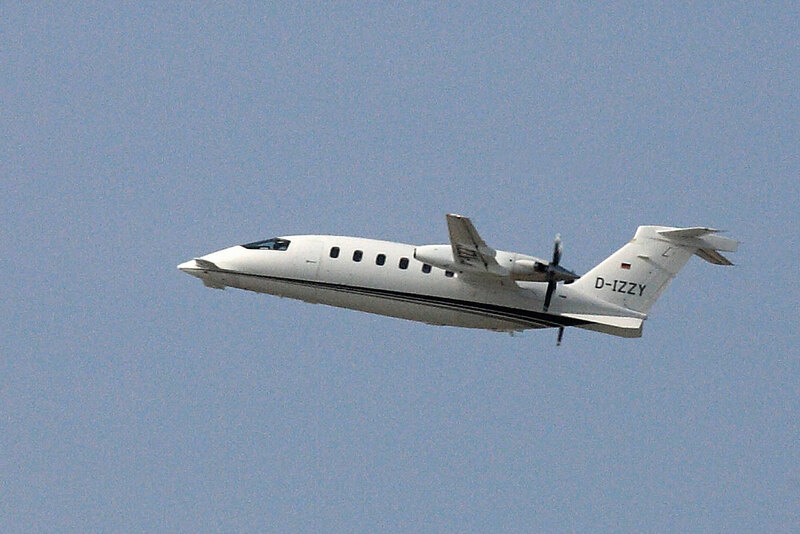 The Dornier jets can accommodate up to 10 patients/attendants and their interior cabin height allows the medical crew to work standing up. 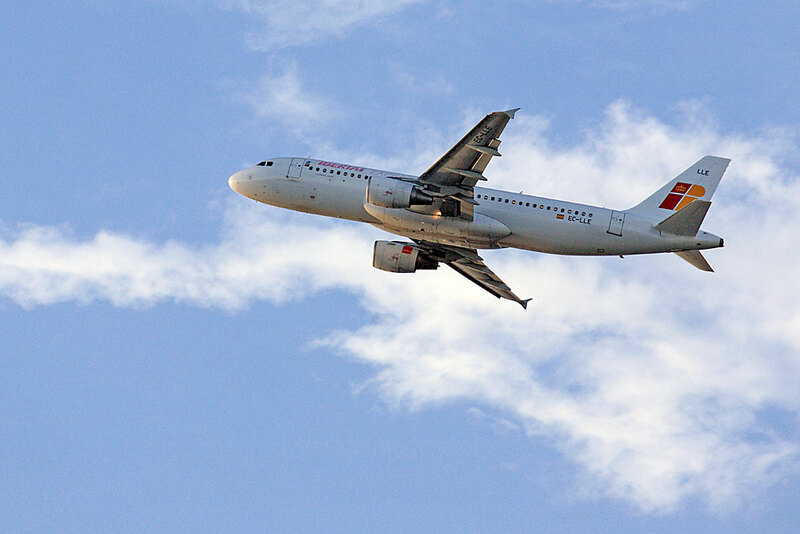 Cabin pressure can be adjusted to the patients’ medical requirements. 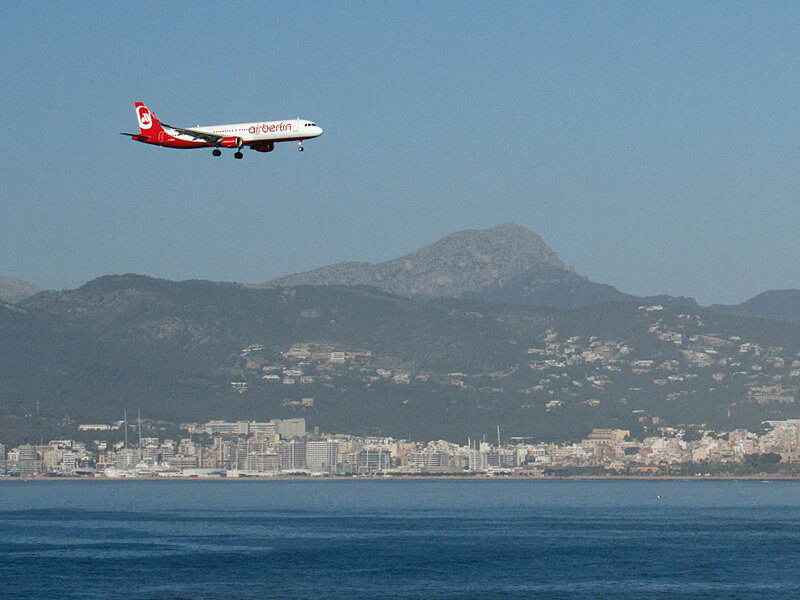 The aircraft was quite high when it flew into view so I don't know whether it was making a steep climb out after take-off or had made an overshoot of the runway. 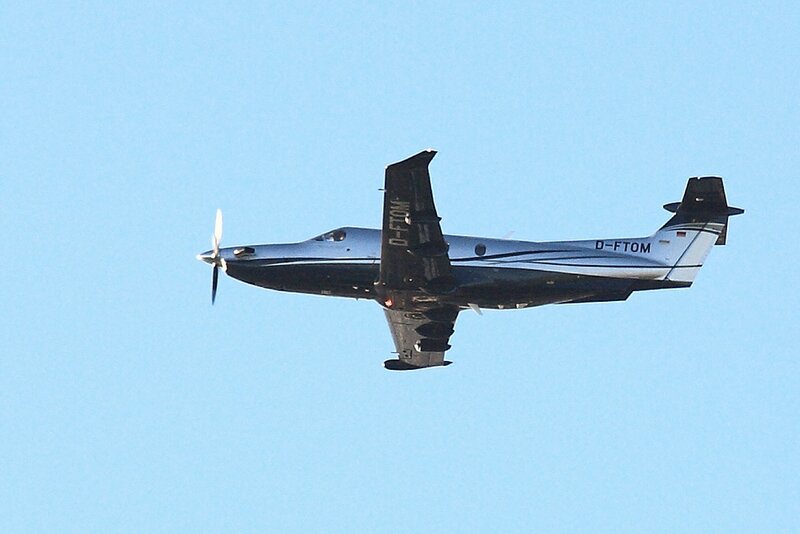 Cessna 525B CitationJet CJ3 OE-GNA was present on Thursday 2 March. G-CIEL shot through the perimeter fence. 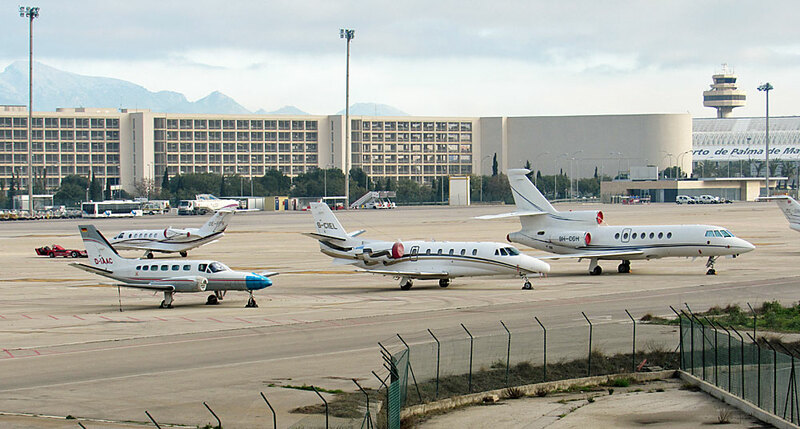 ​Aircraft present on the biz jet ramp on departure day, Monday 6 March, included Citation Bravo G-IPLY, CitationJet CJ2 D-IPCH, Raytheon 390 Premier I D-IKGT, Hawker Beechcraft 125-900XP M-CKAY, Pilatus PC-12 M-SAIL and Swiftair Embraer EMB-120FC Brasilia EC-HFK. 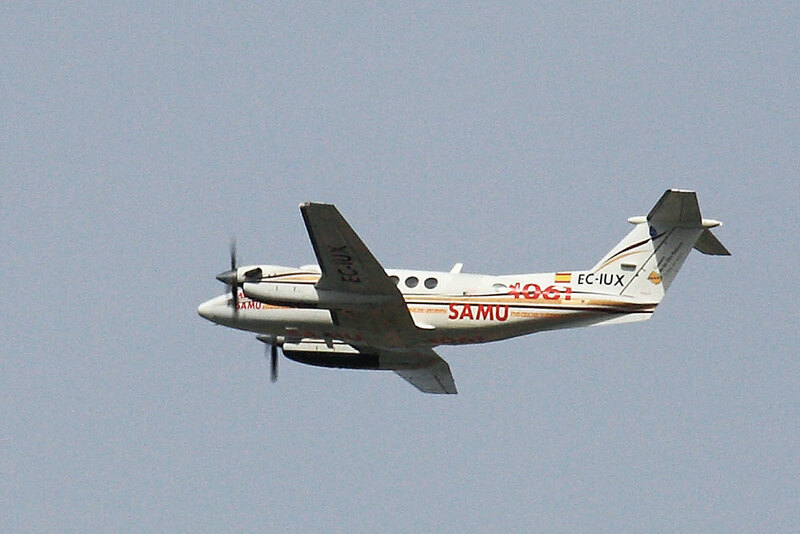 Cessna 441 D-IAAC with its engines removed looks in a poor state. Beechcraft C90A King Air F-GULY. 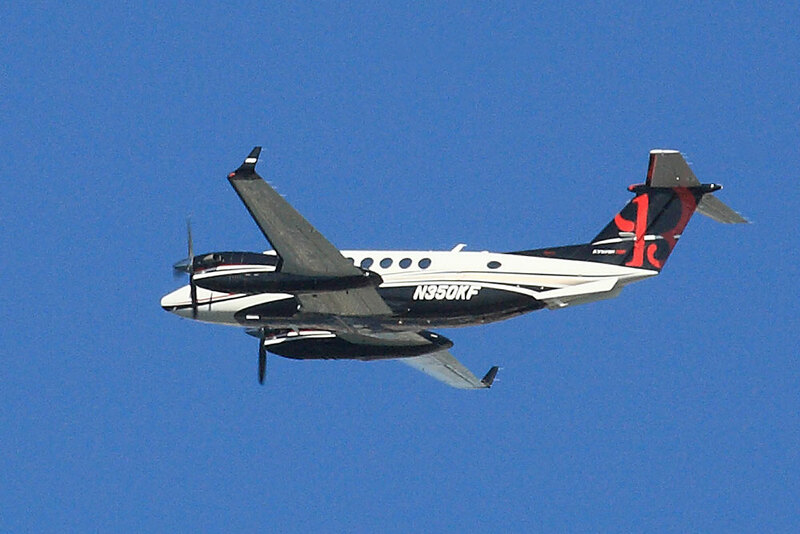 Super King Air 300 N350KF was snapped on Tuesday 28 February. 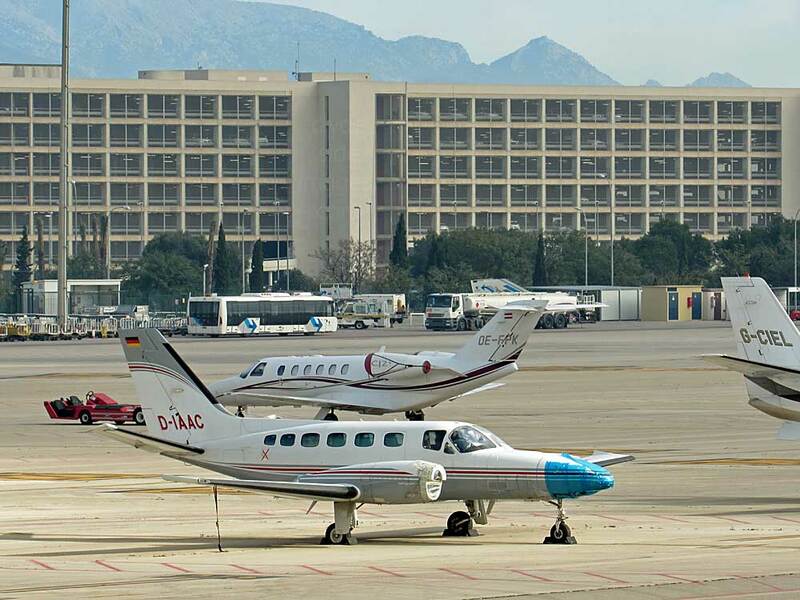 The military have a permanent base at the airport. 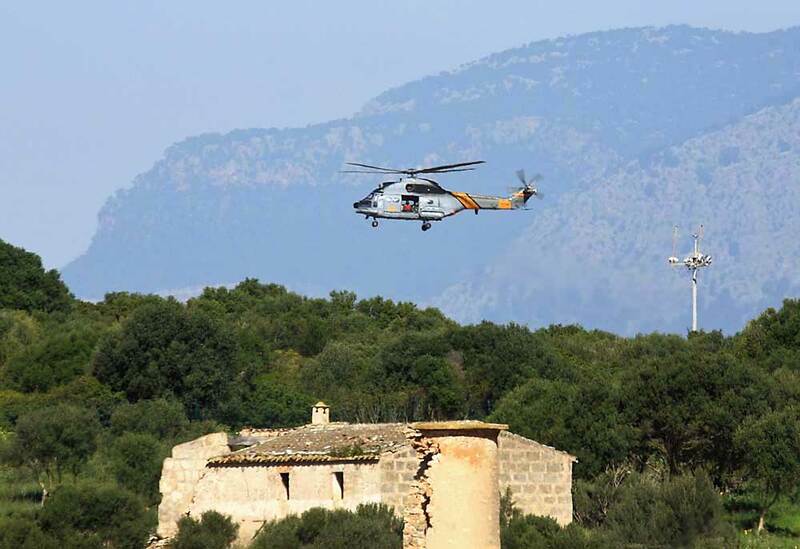 This shot of an unidentified helicopter was taken from the hotel balcony. 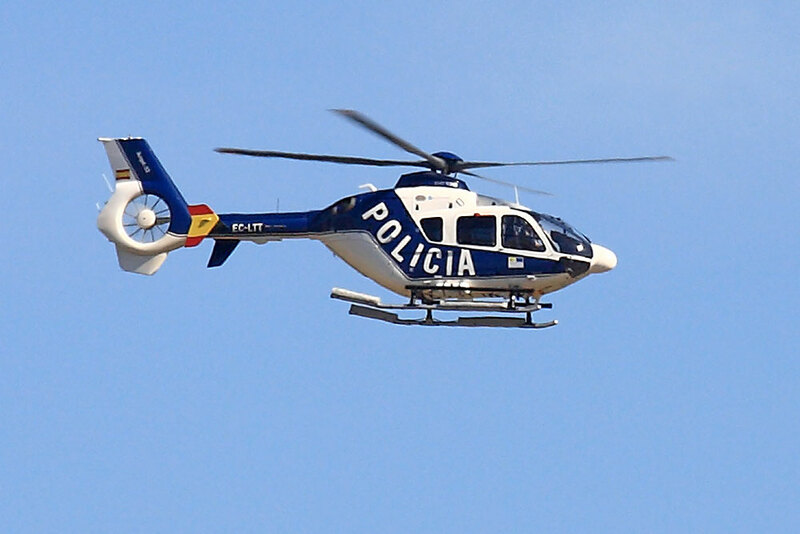 Police Eurocopter EC135 P2+ EC-LTT. 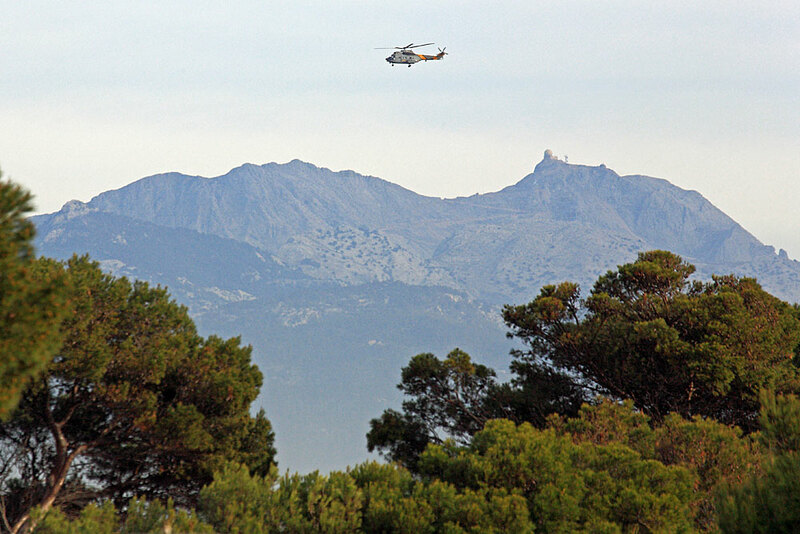 An SAR chopper returns to base. 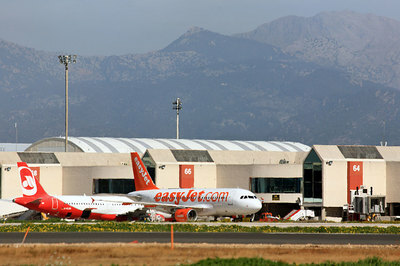 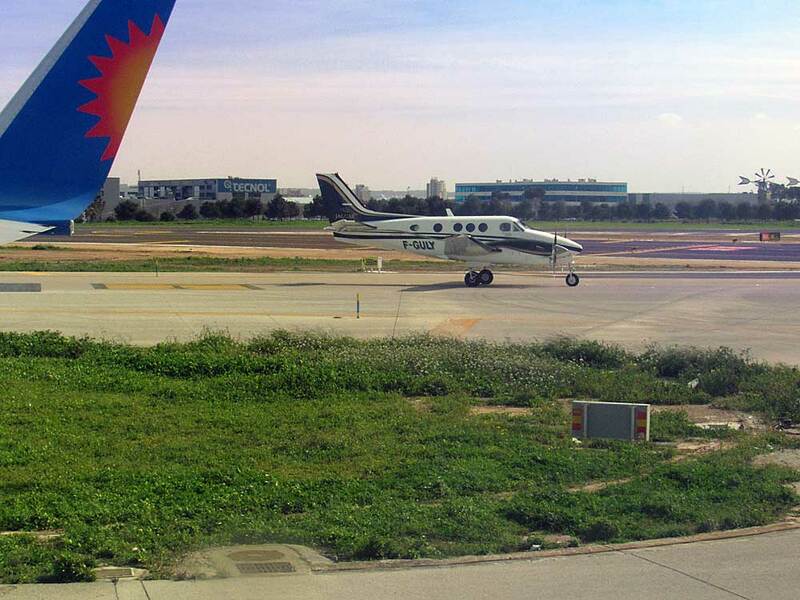 Palma Airport, 2 March. 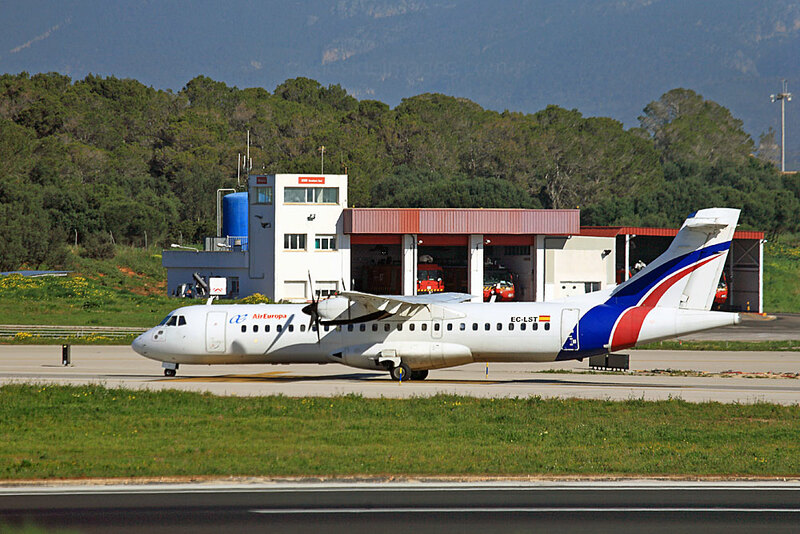 There was no activity on the military apron when my Jet2 plane taxied past on departure day, just a CASA turboprop nose-in to the hangar.